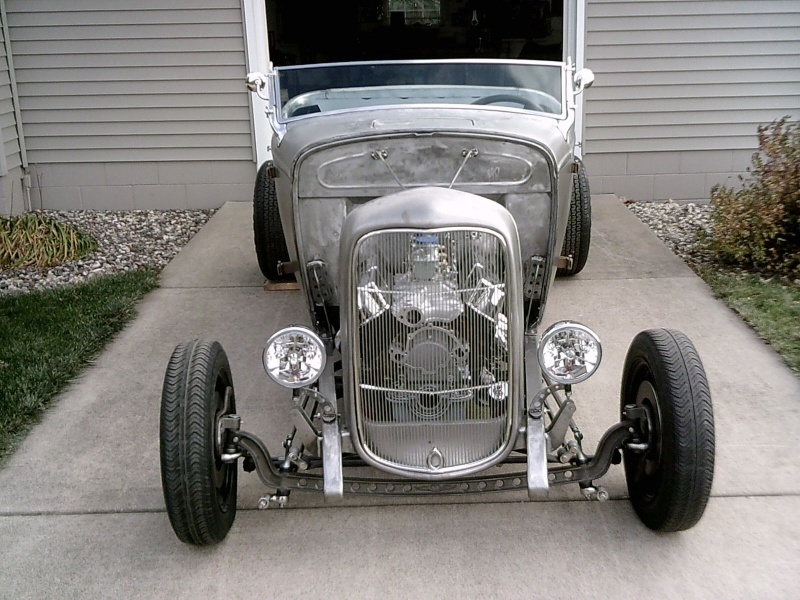 BROOKVILLE steel body and boxed frame. 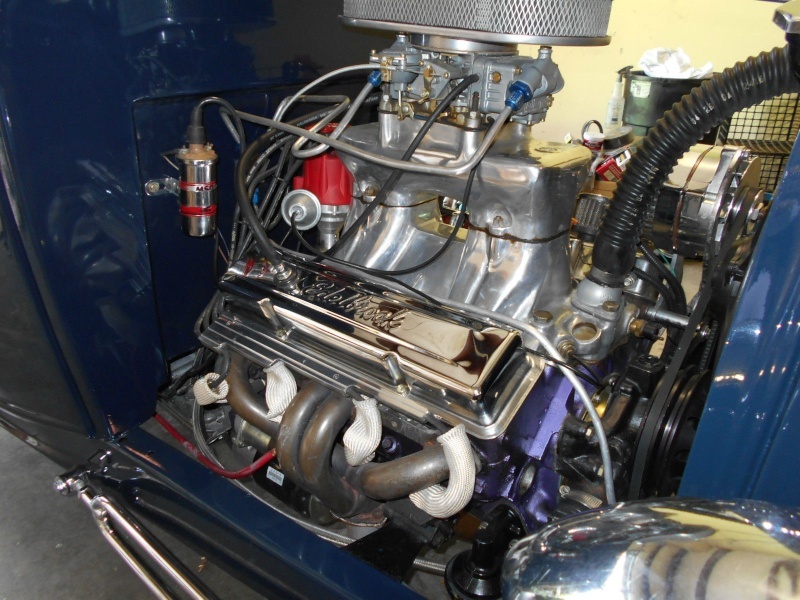 1963 Chevrolet 283, fresh rebuild, 40 over. 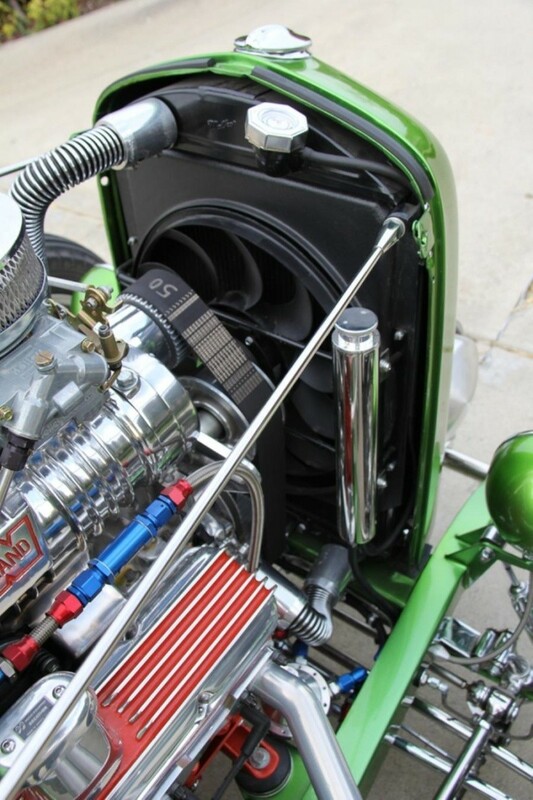 ZIPPS water pump riser with aluminum water pump. 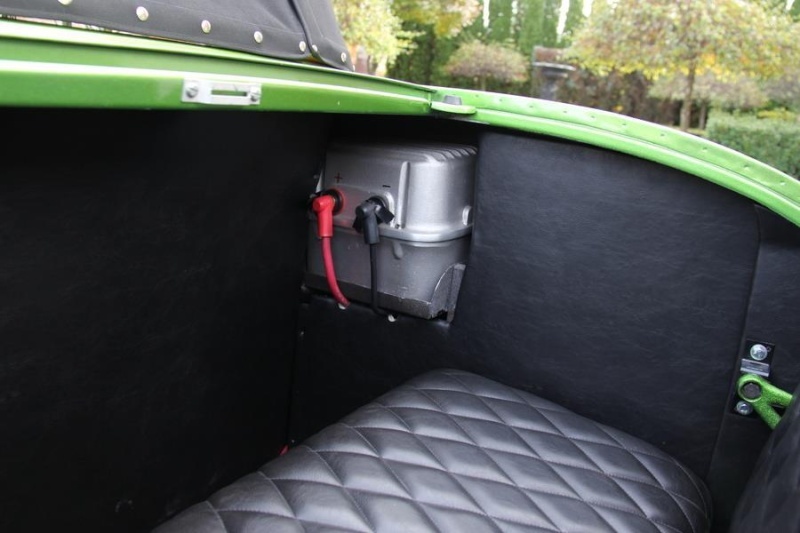 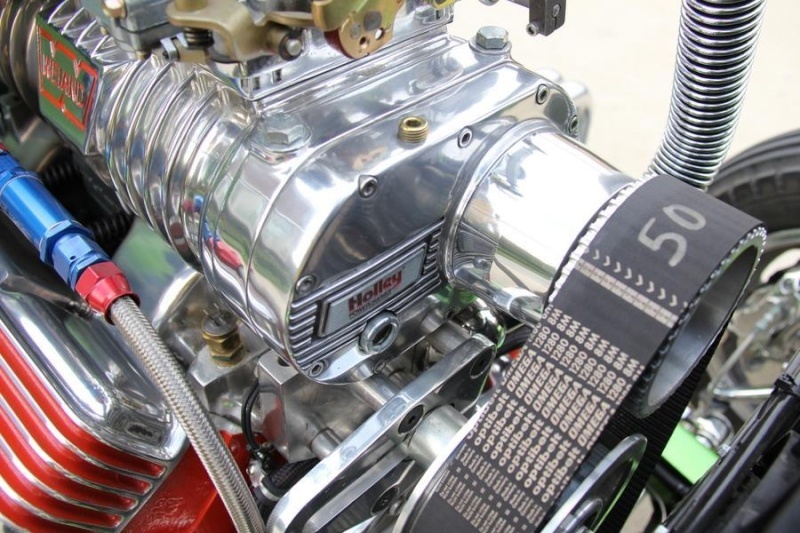 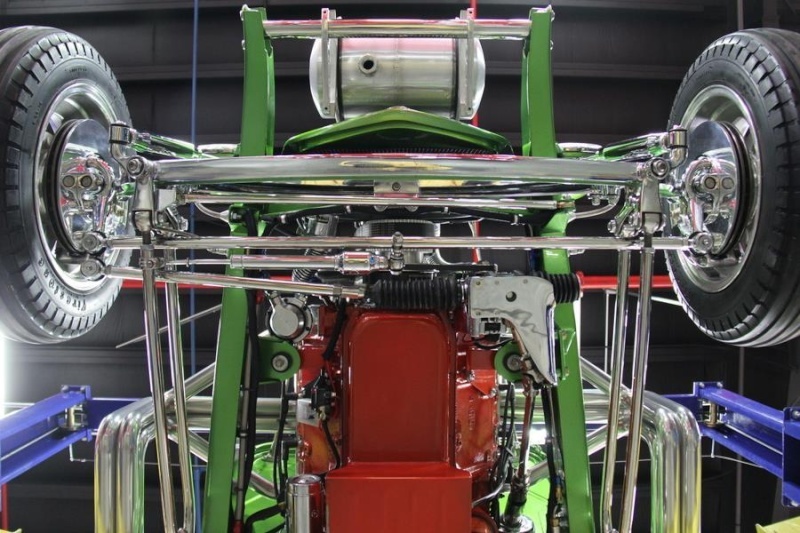 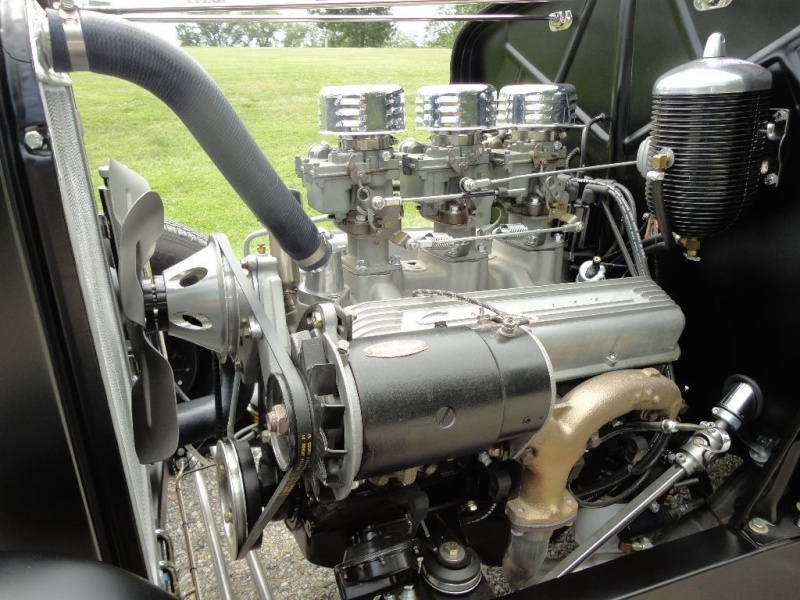 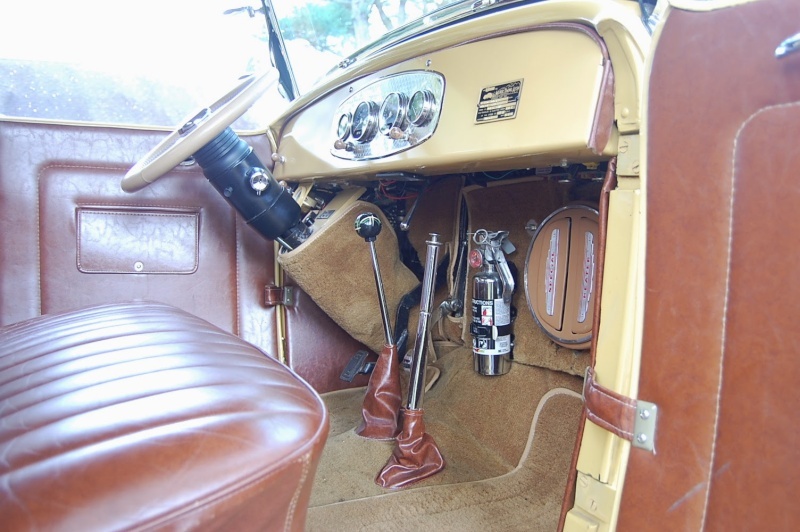 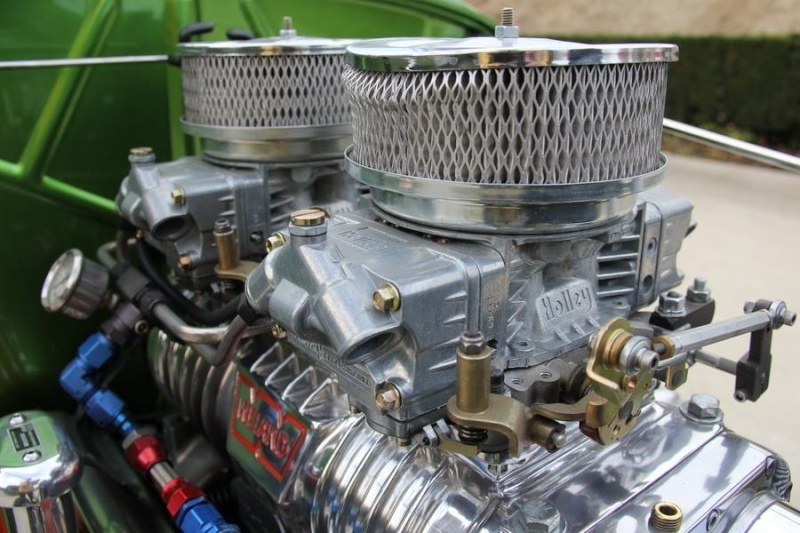 3 ROCHESTER 2G carburetors built with progressive linkage. 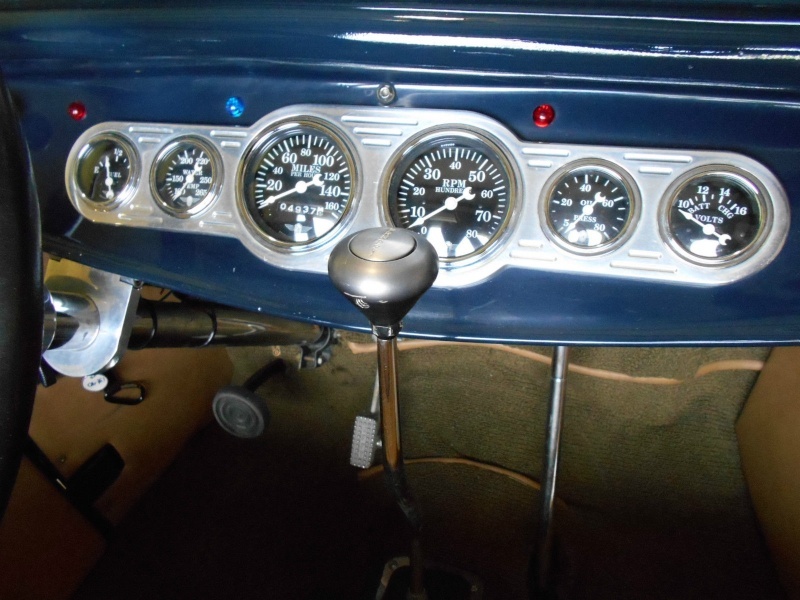 Early 70's BORG-WARNER Super T-10 close ratio 4-speed. 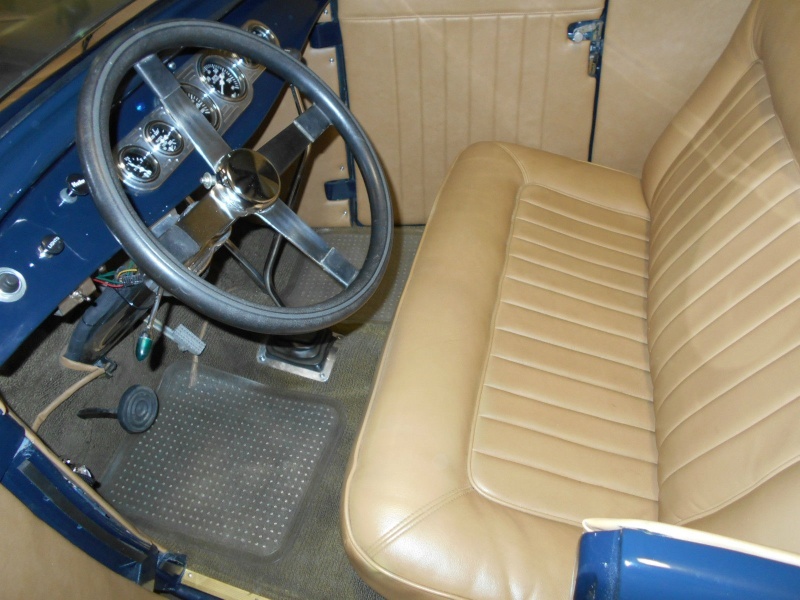 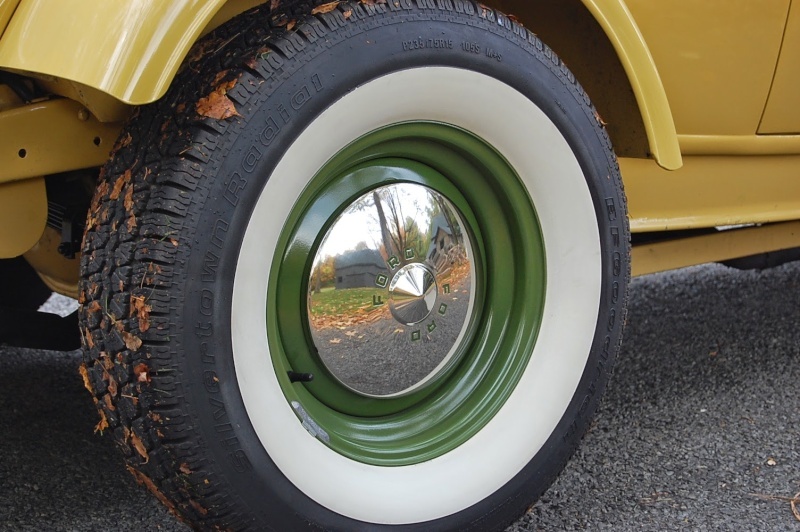 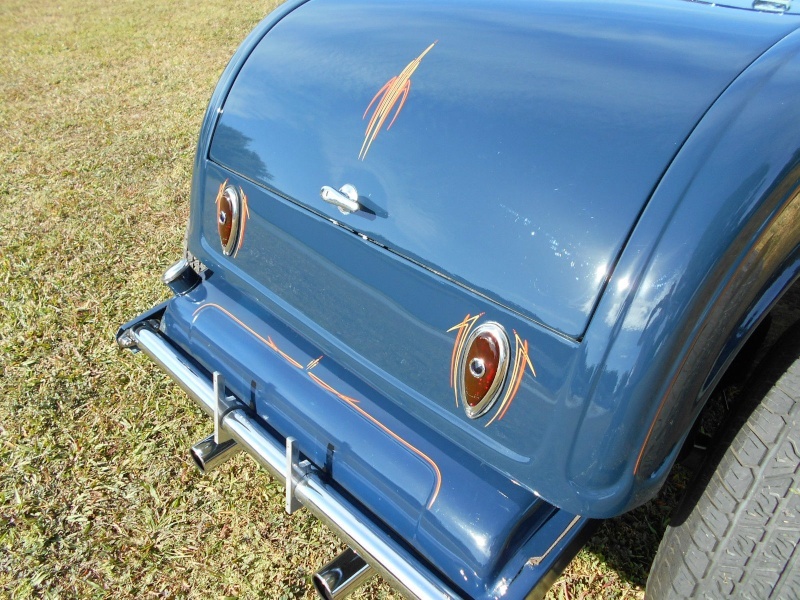 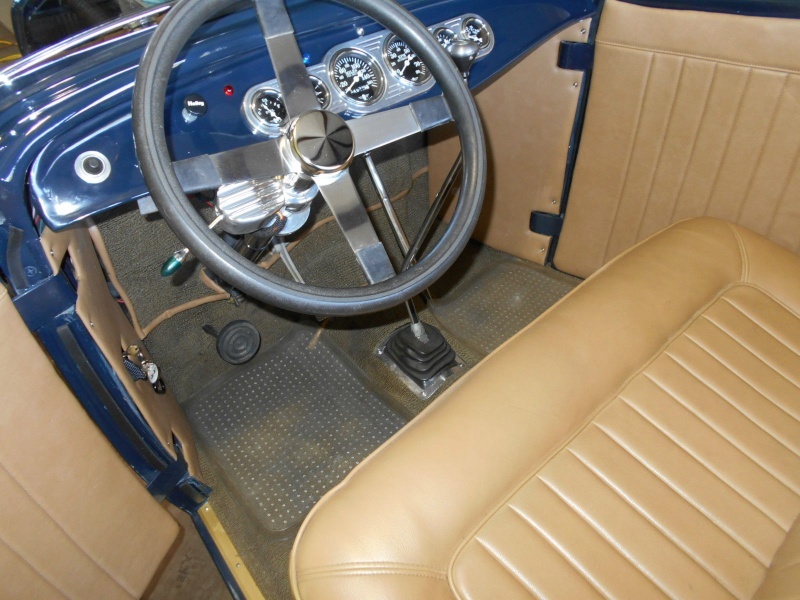 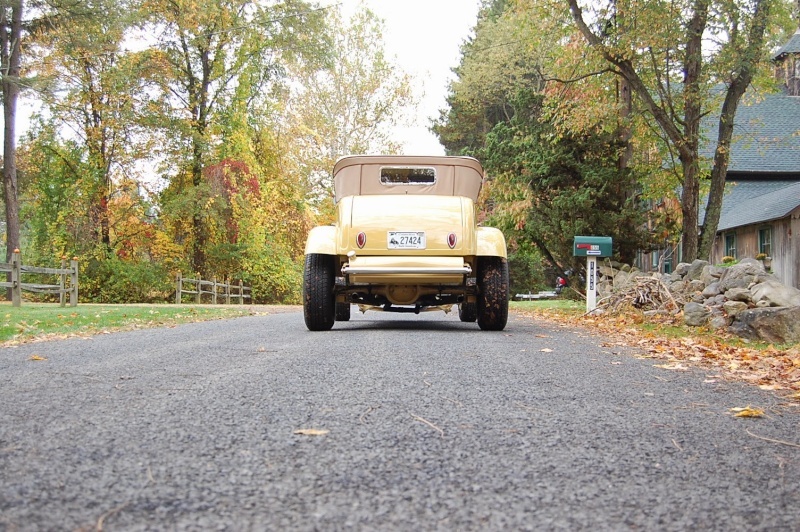 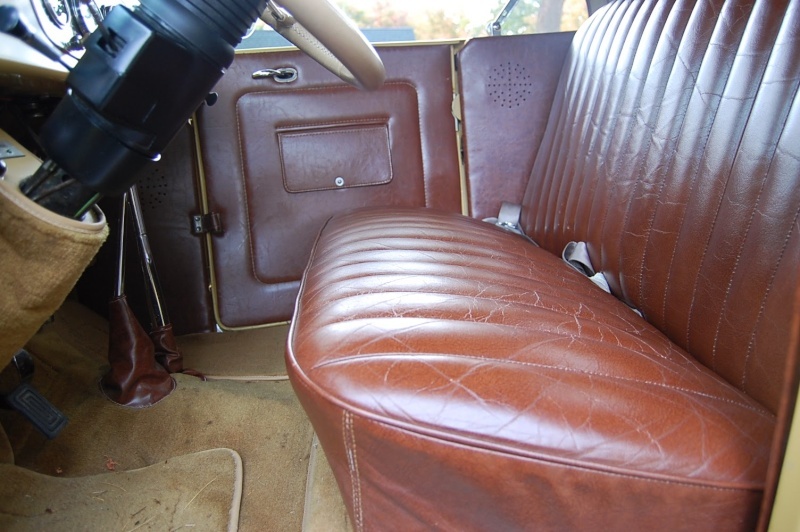 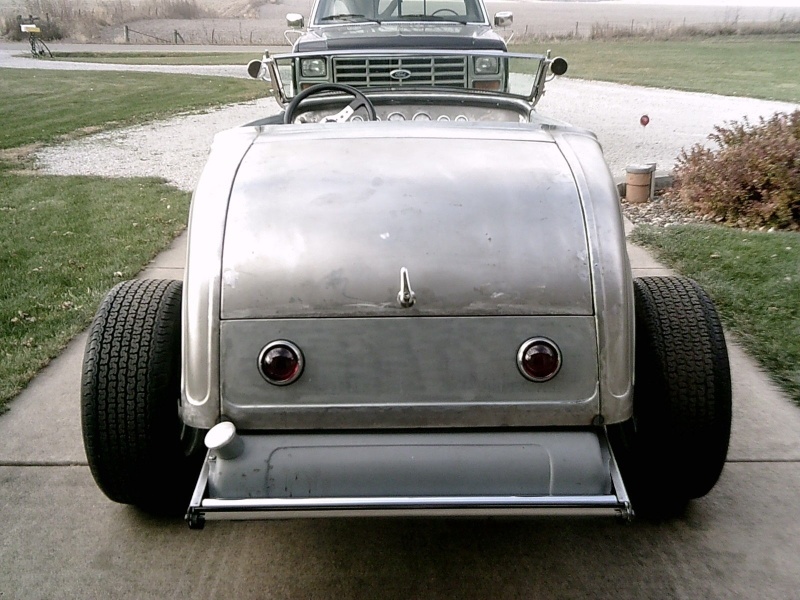 1957 Ford 9" open rear end, 3:10 gears, stock drum brakes. 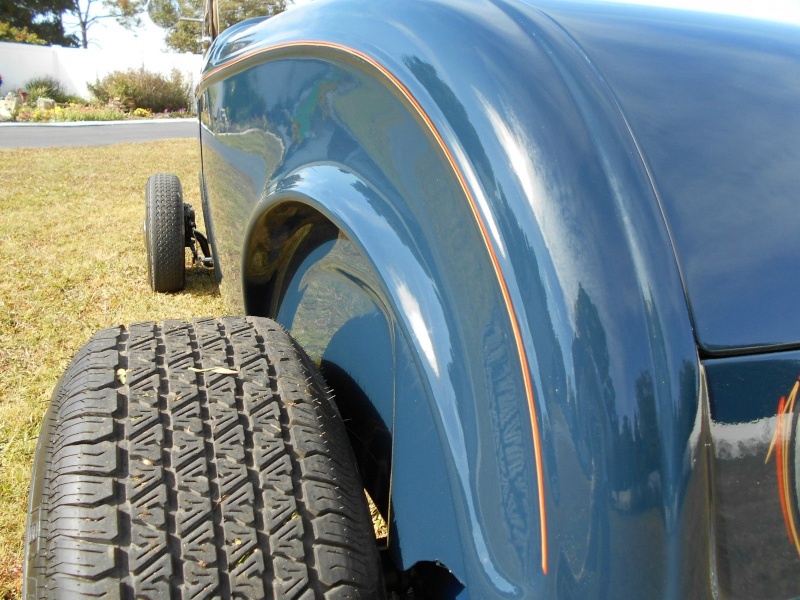 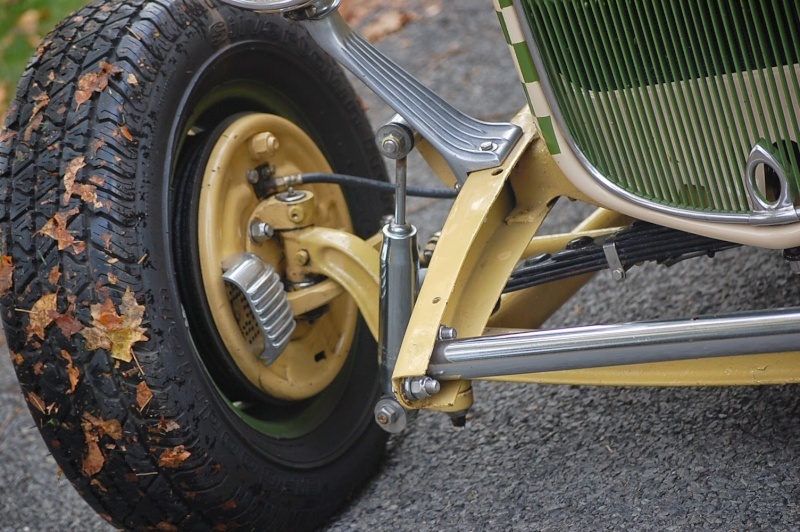 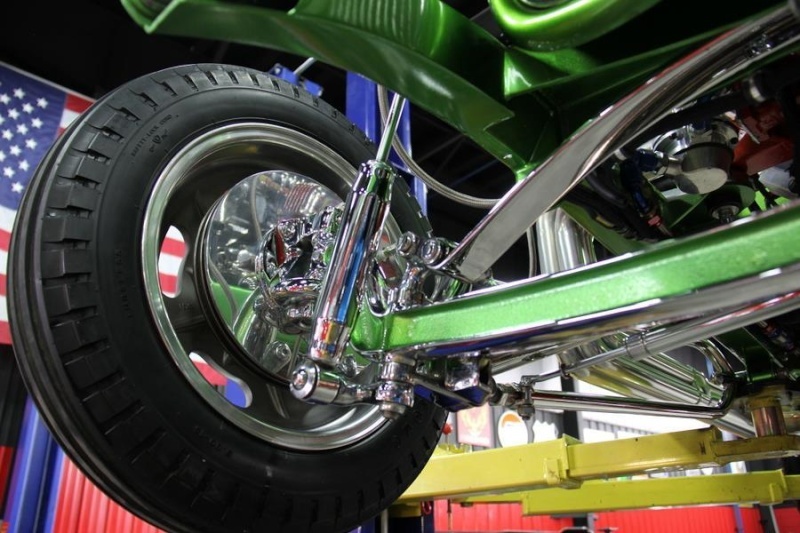 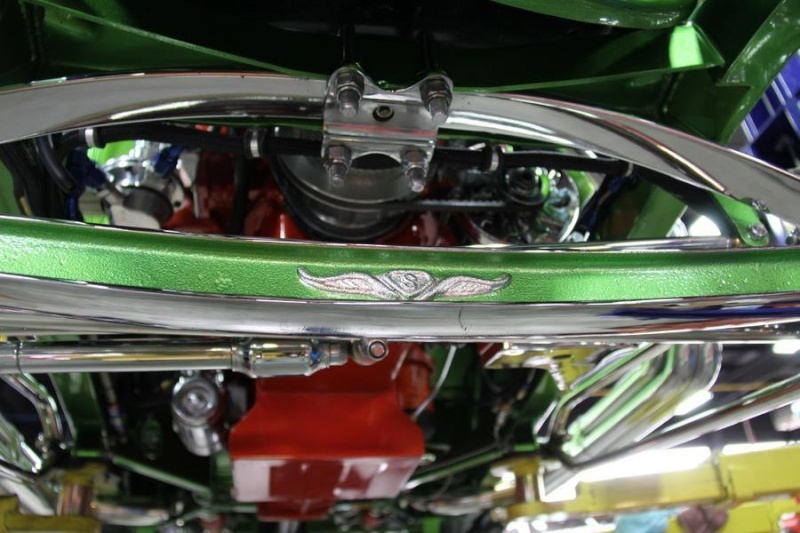 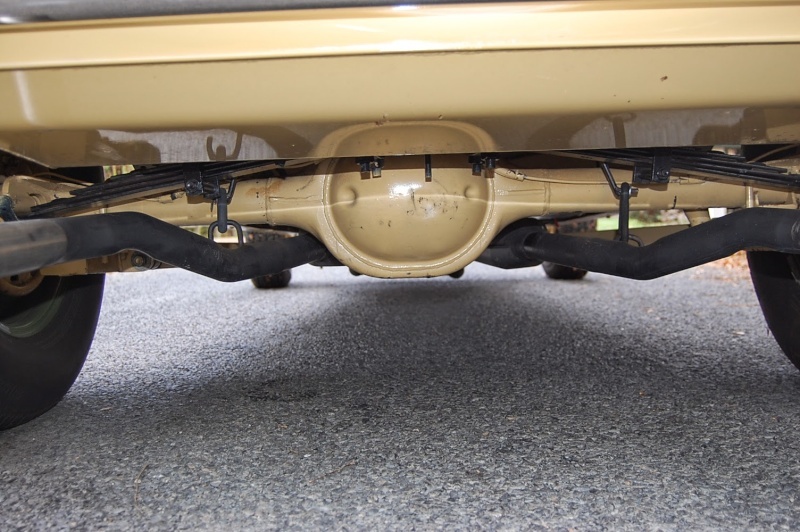 Chassis engineering forged front axle with 1951 FORD 5 Star pickup BENDIX brakes. 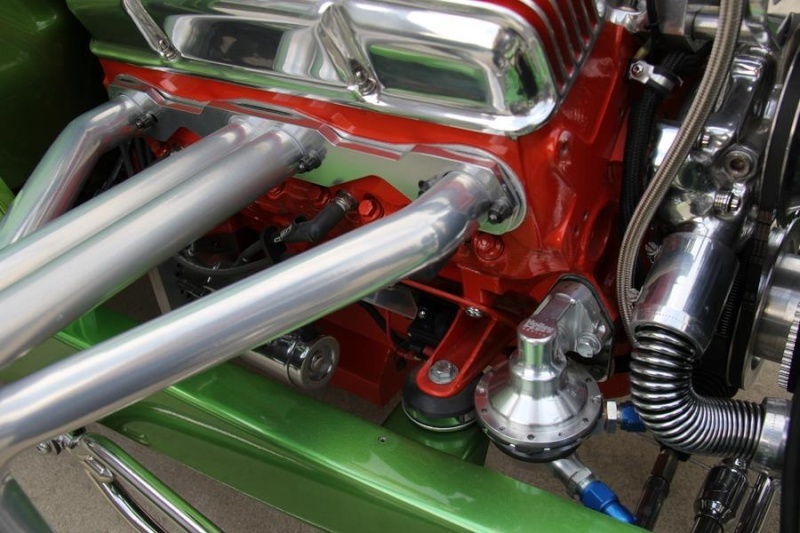 Stainless drag link and tie rod. 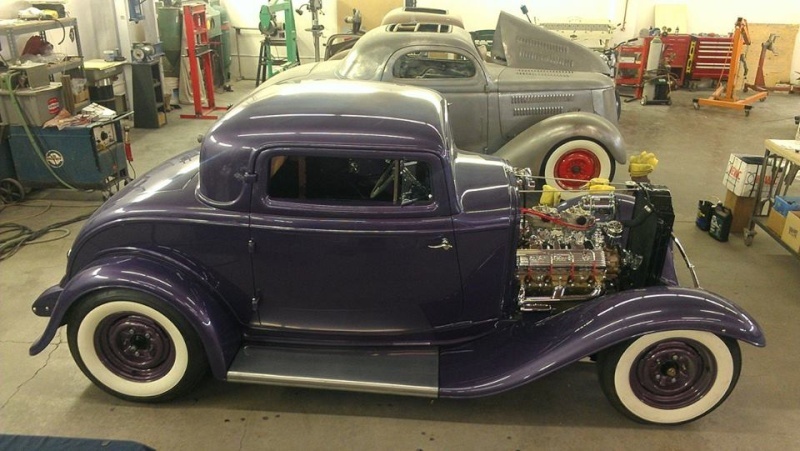 Here's that Olds Powered channeled 32 you posted a little while back.It was owned by Bob Stowell of the Frisco Shifters San Francisco,Ca.This car is still in the Bay Area and un-restored but getting pretty shabby.Last time I saw it he drove it to the Swanx Fall Fiasco Show in Vallejo,Ca 2012.Featured in May 1962 HRM. 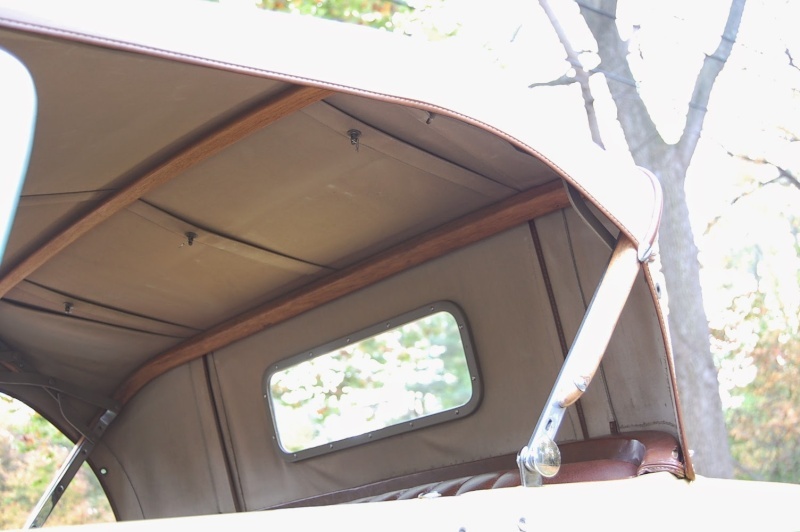 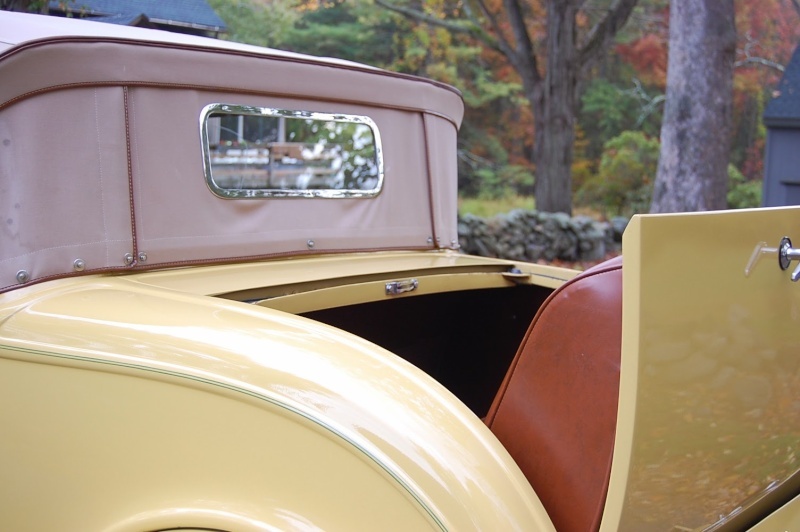 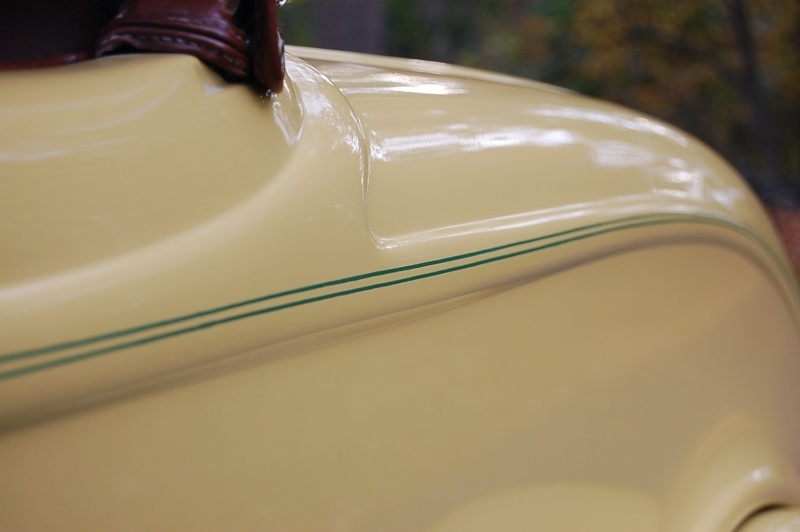 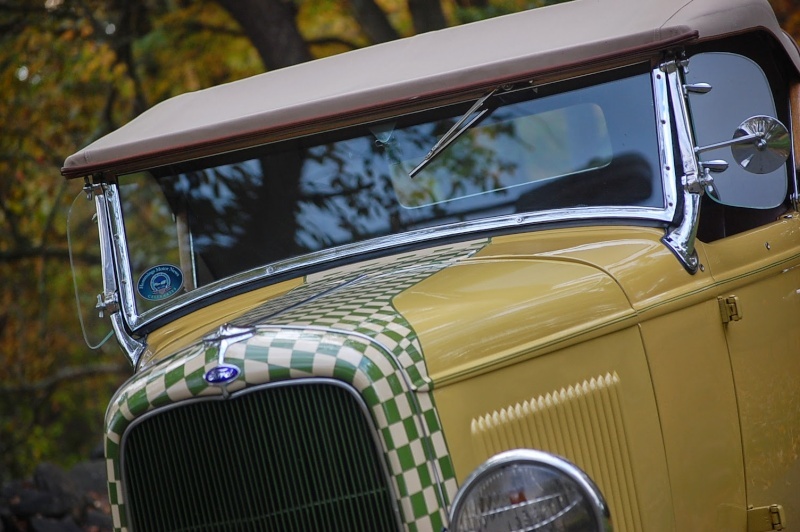 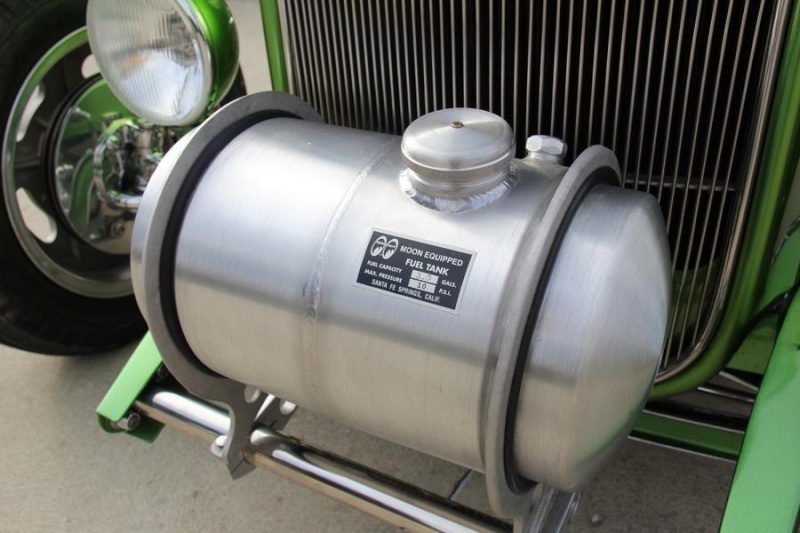 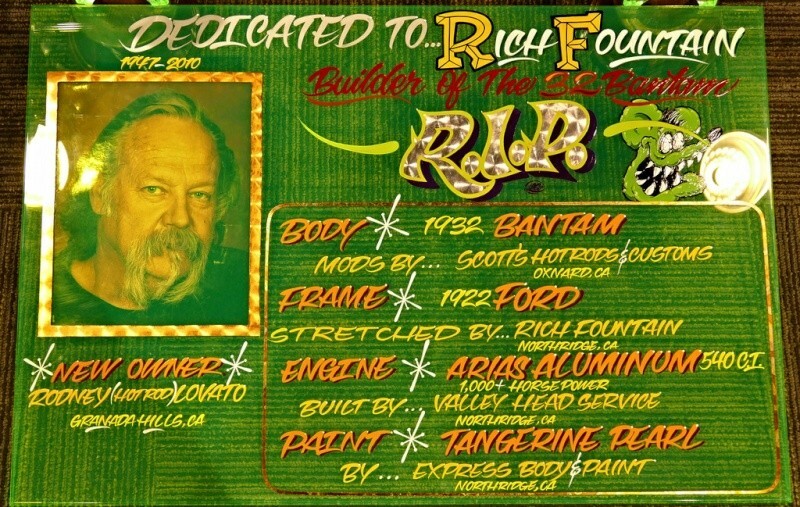 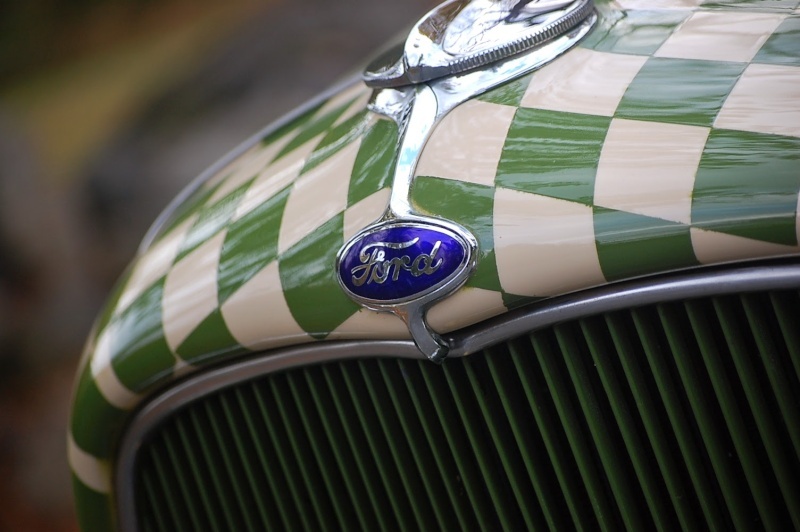 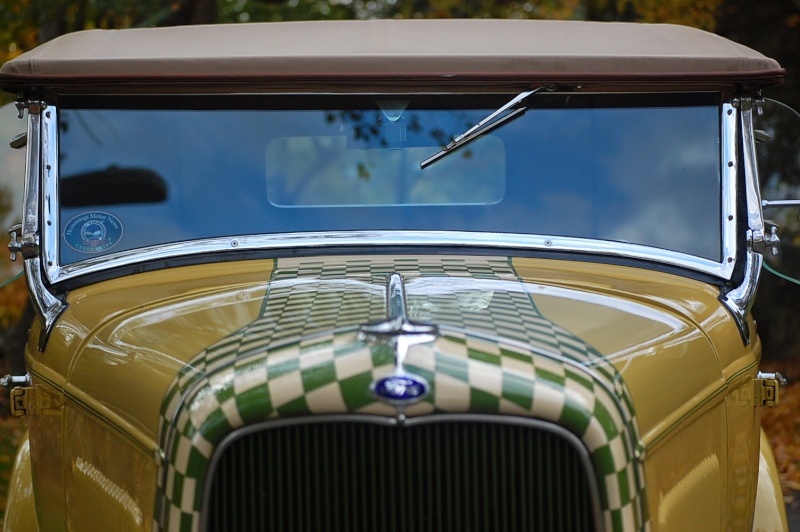 Henry Ford Frame, Hood, Grille and Shell. 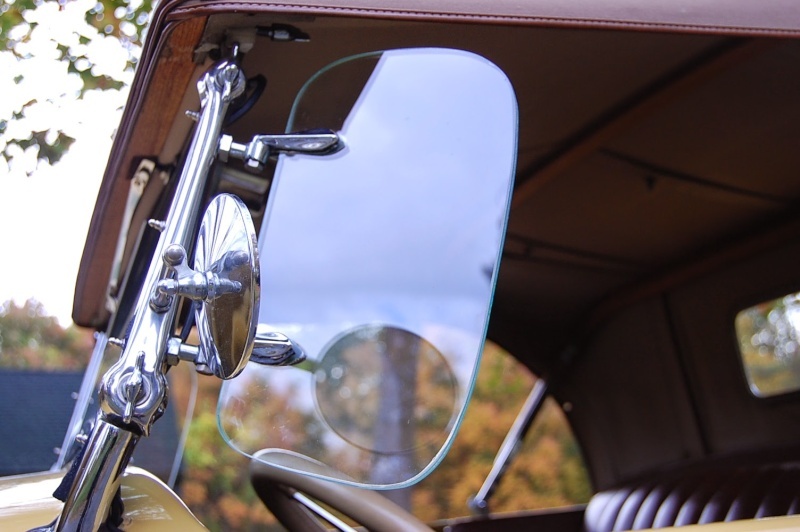 Wescott glass body. 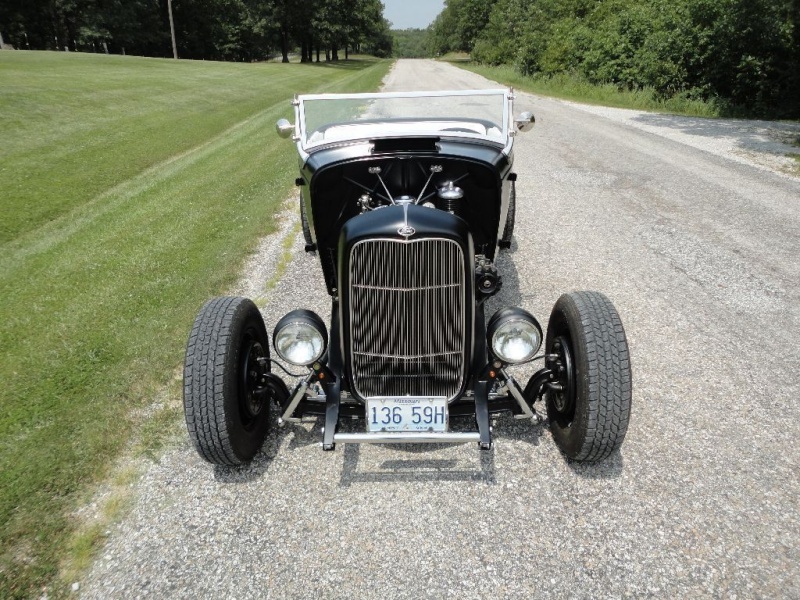 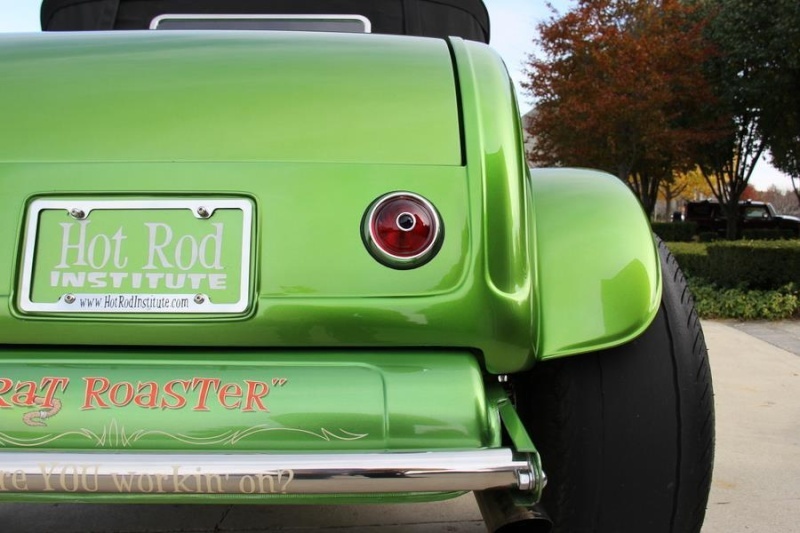 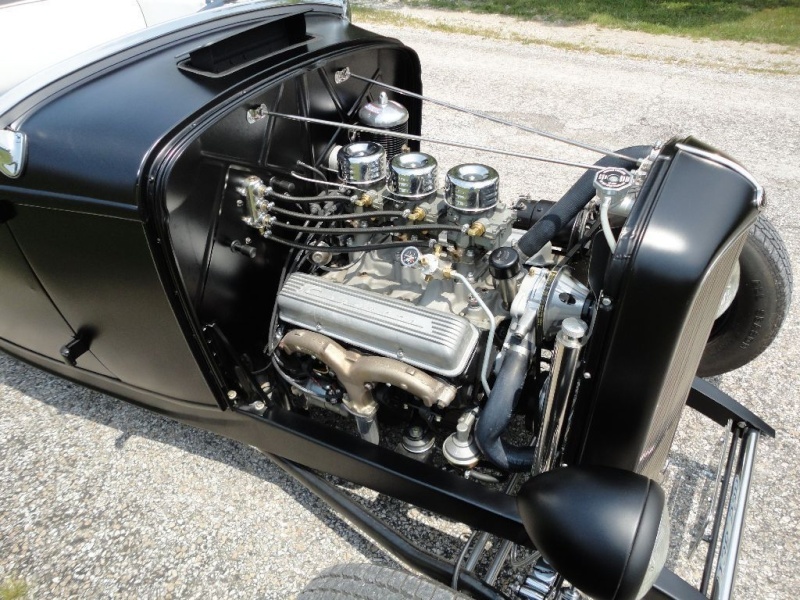 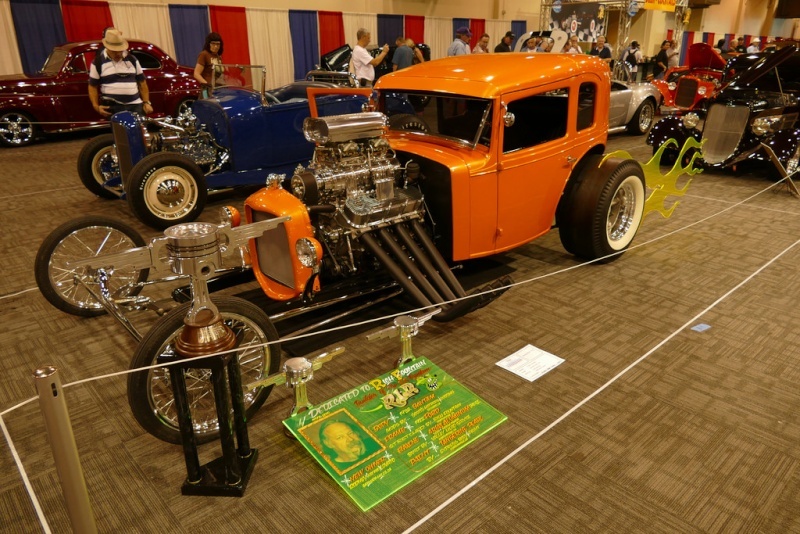 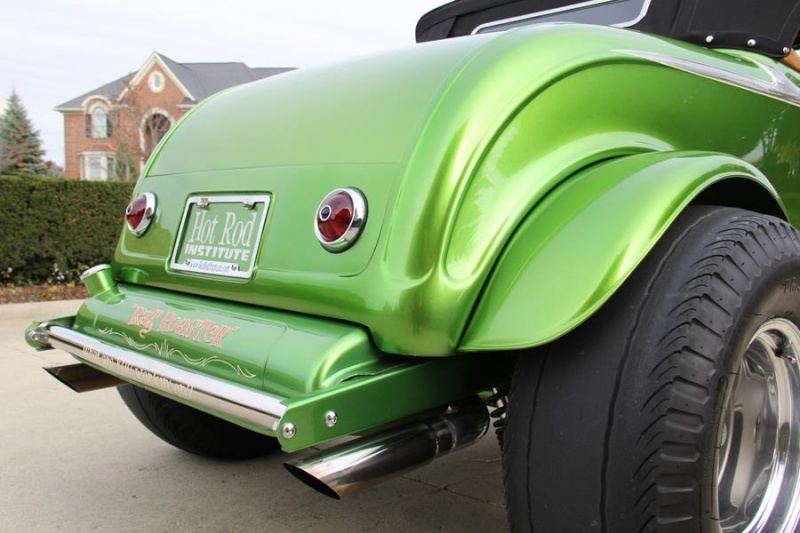 '32 Ford - South City Rod and Custom. 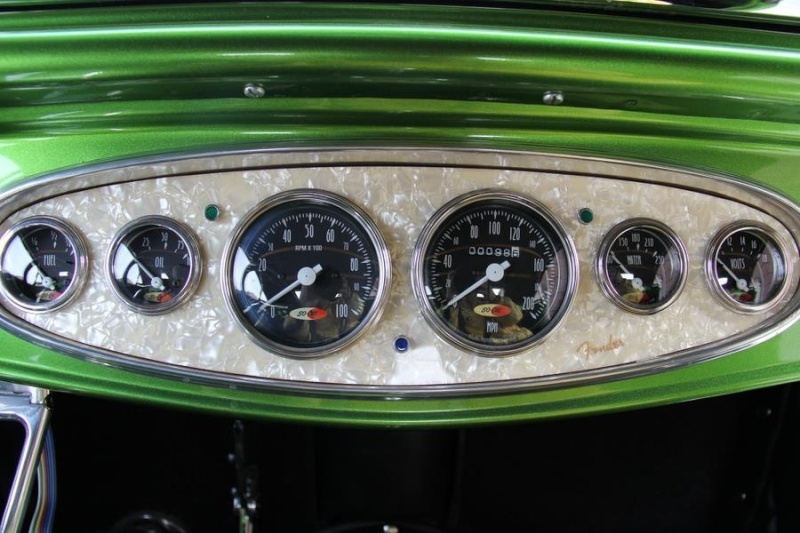 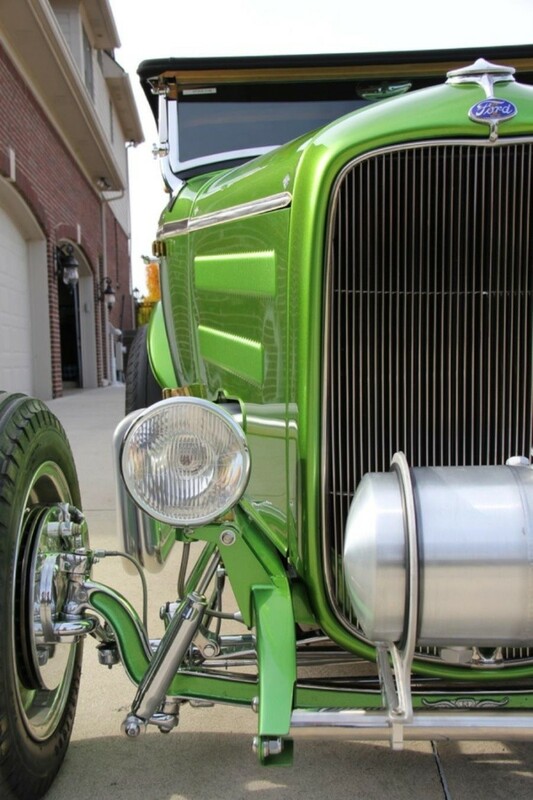 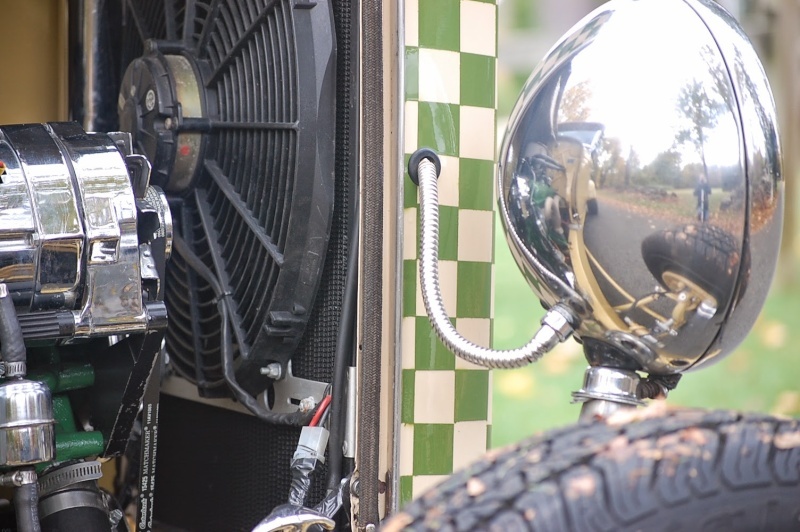 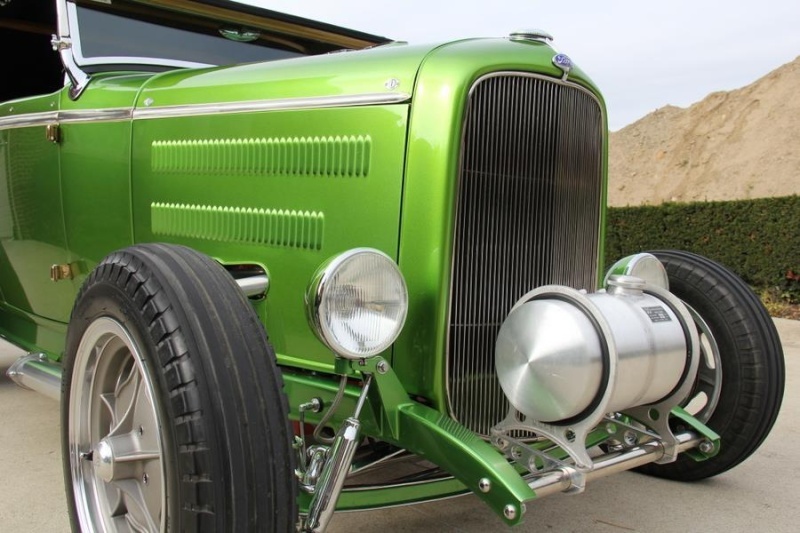 This one-of-a-kind, custom roadster was built on National TV by Stacey David on the TV show GEARZ TV. 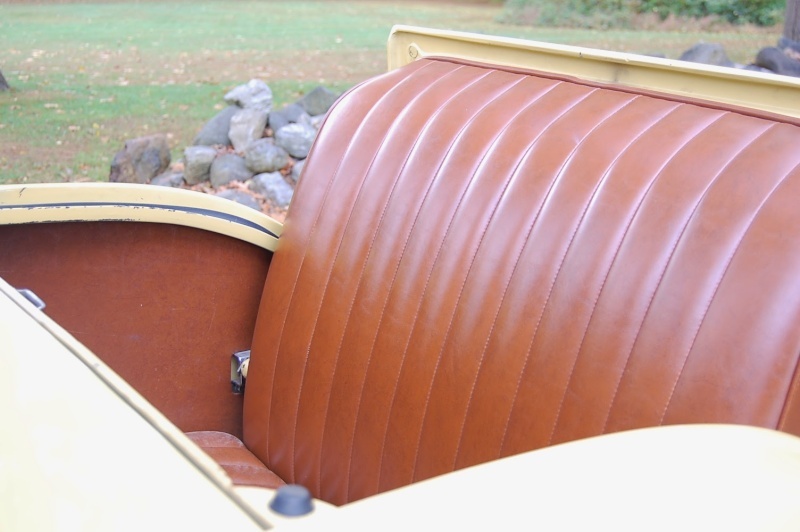 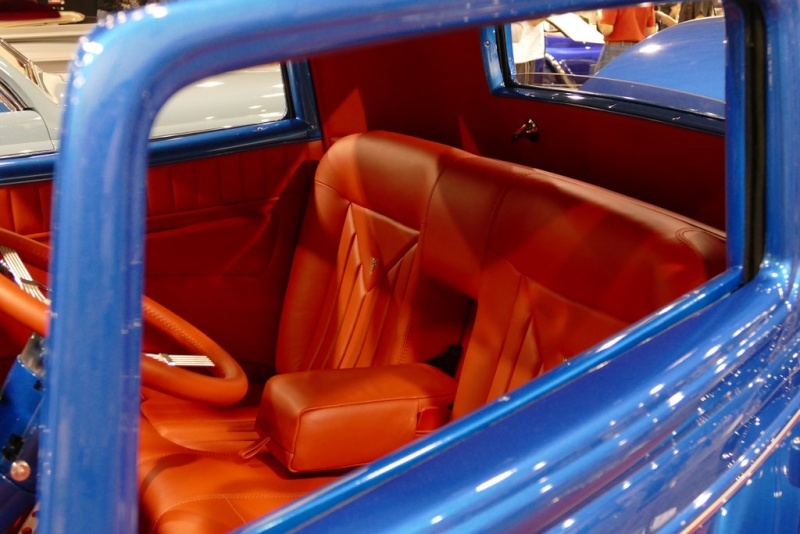 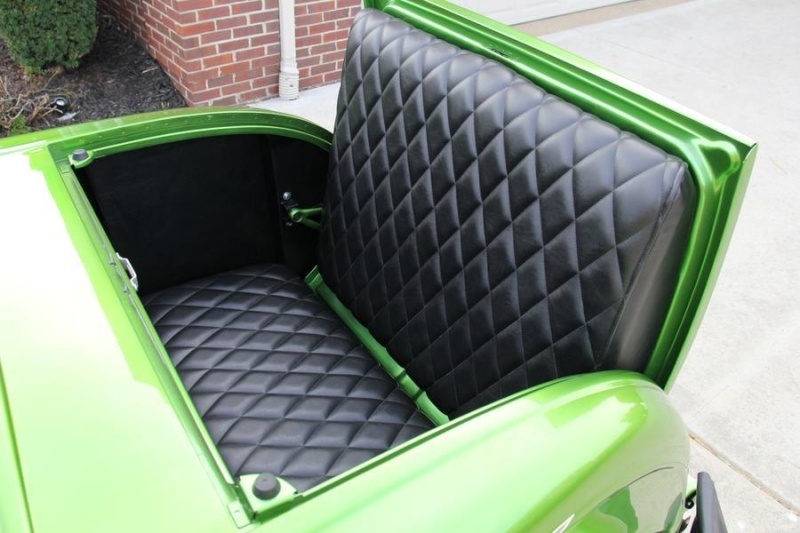 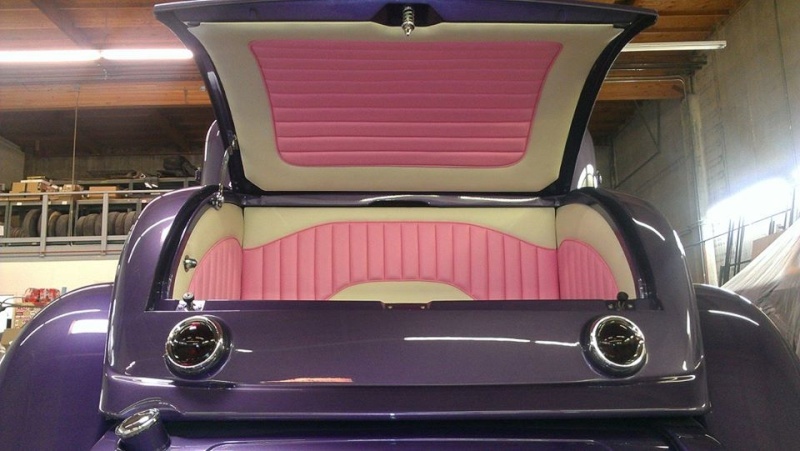 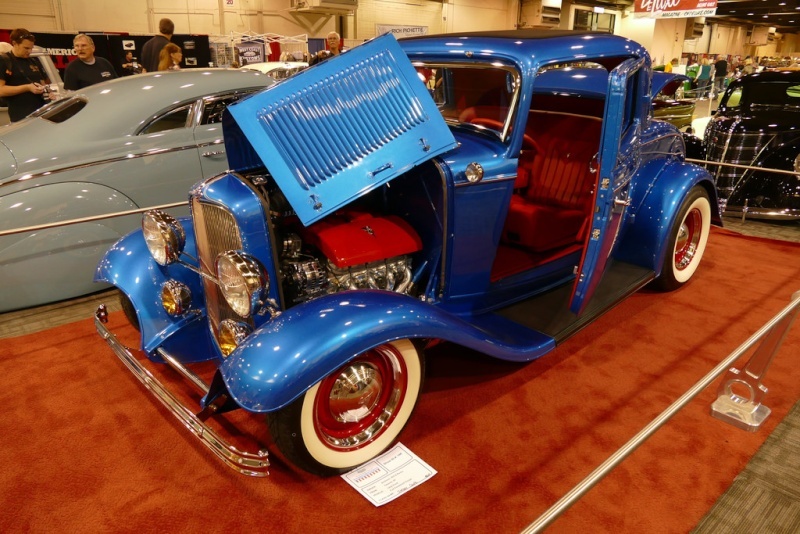 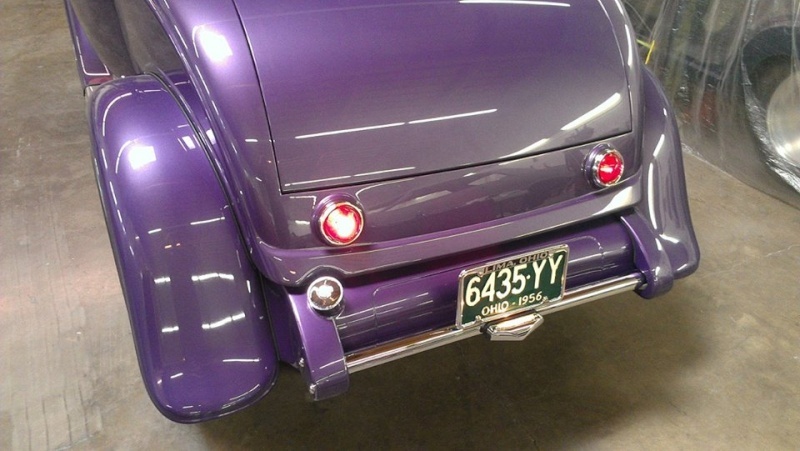 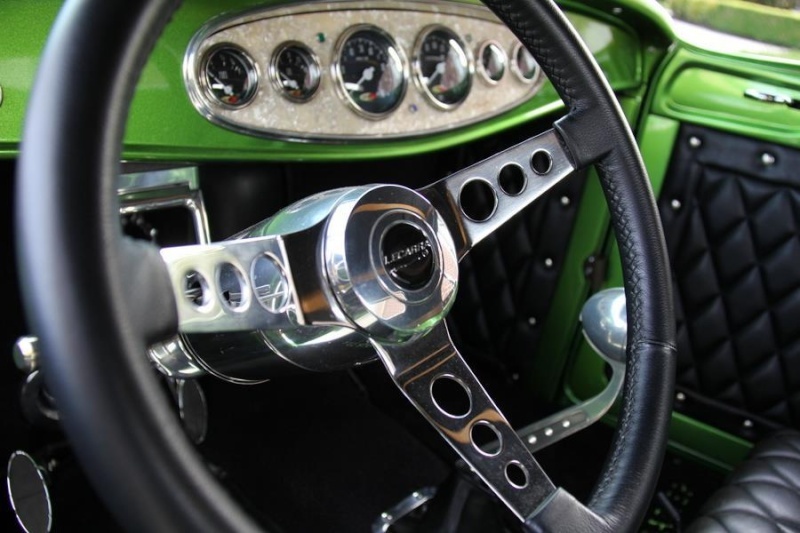 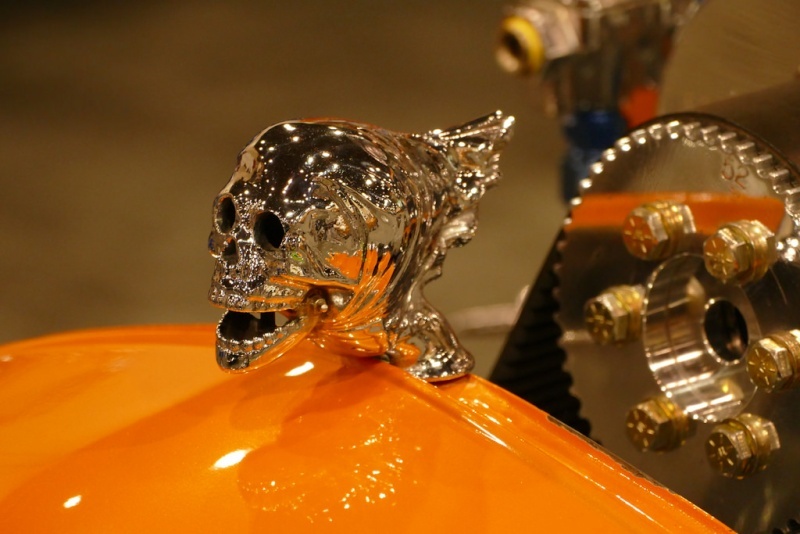 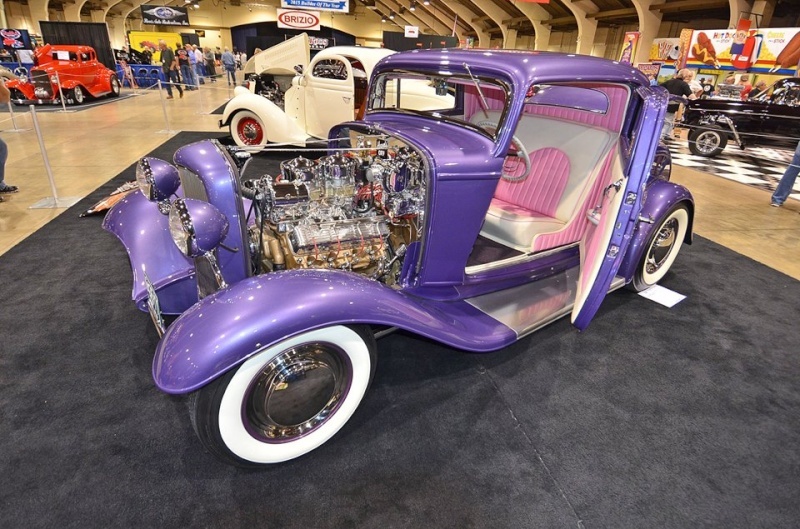 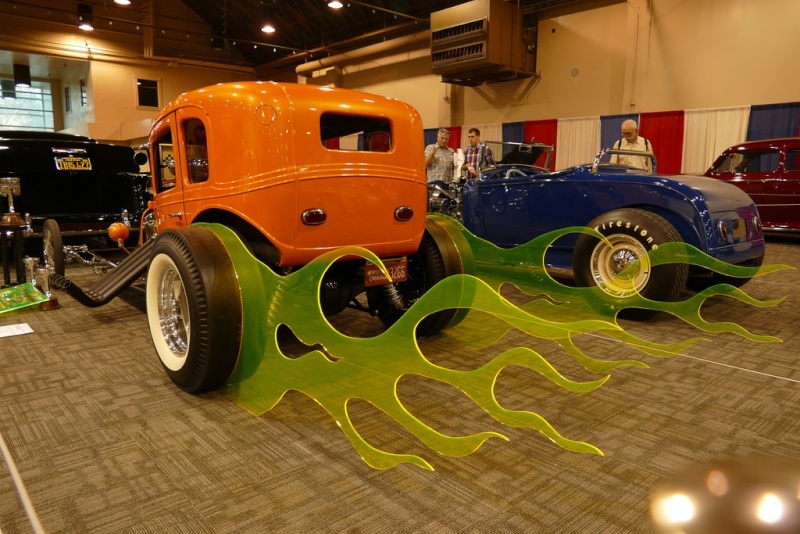 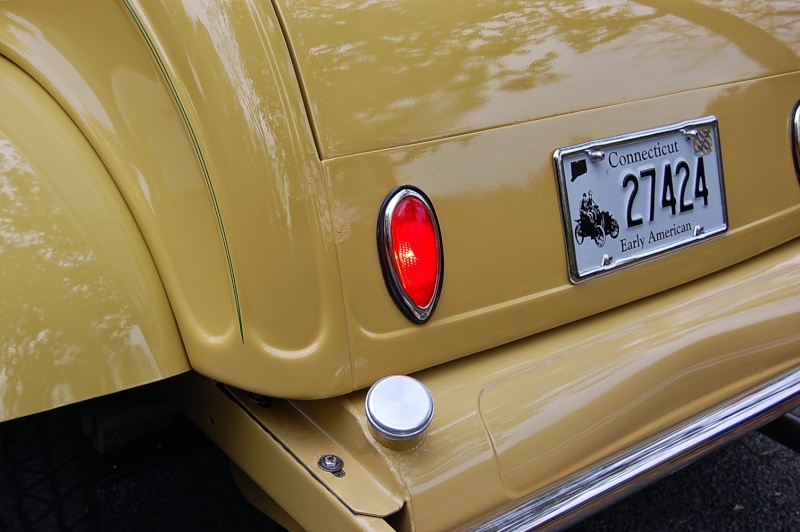 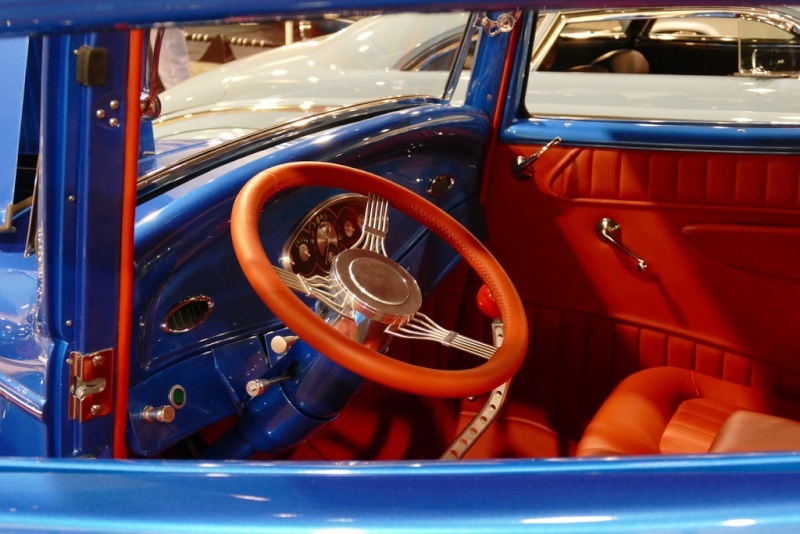 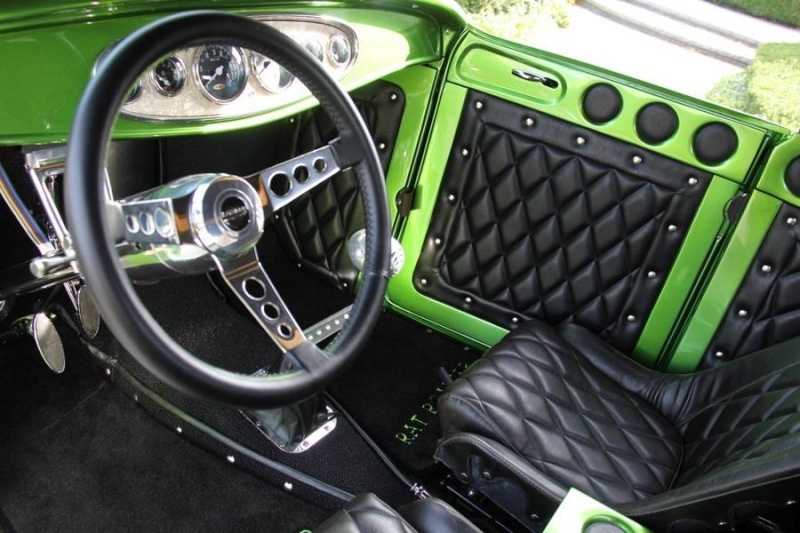 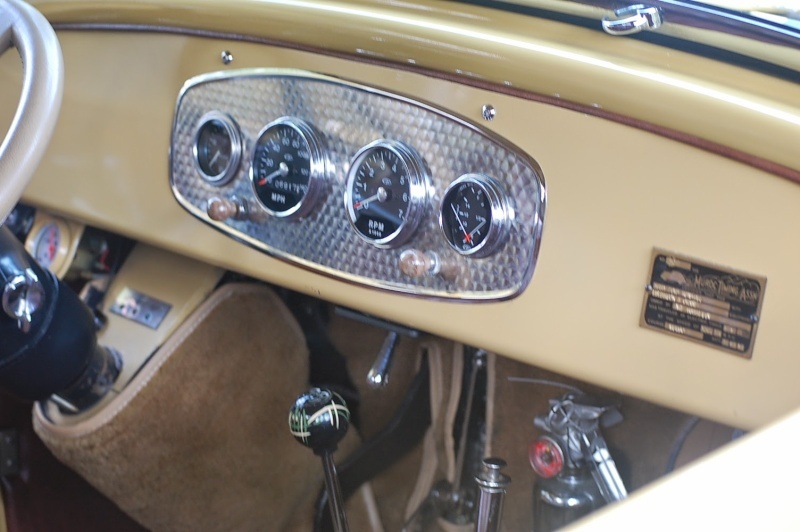 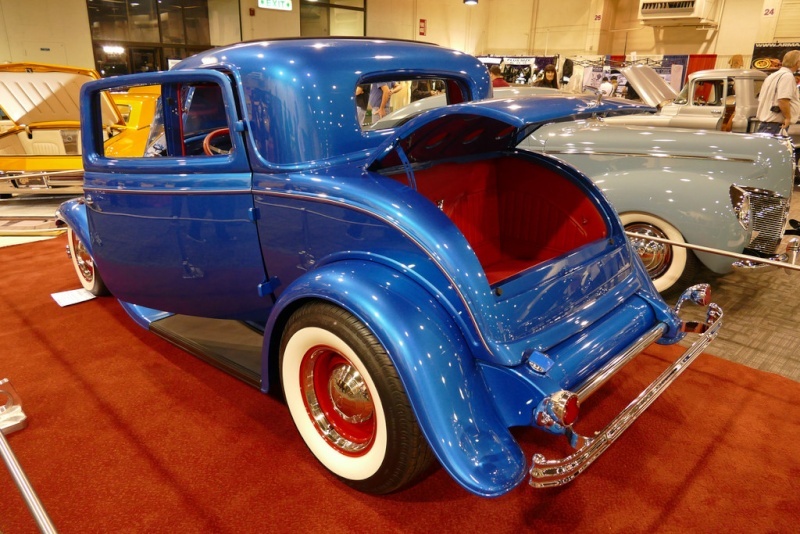 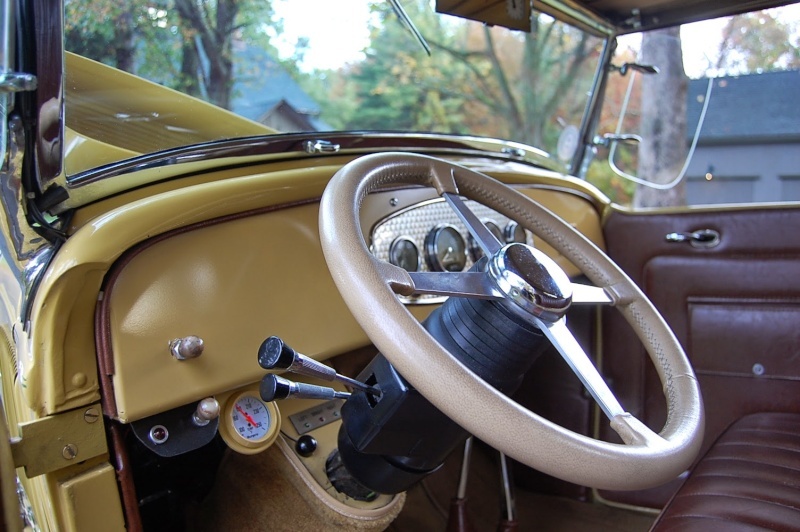 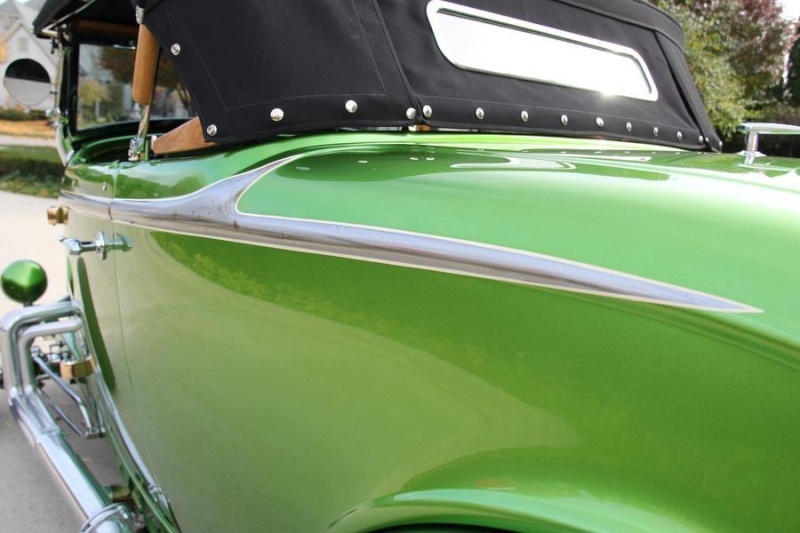 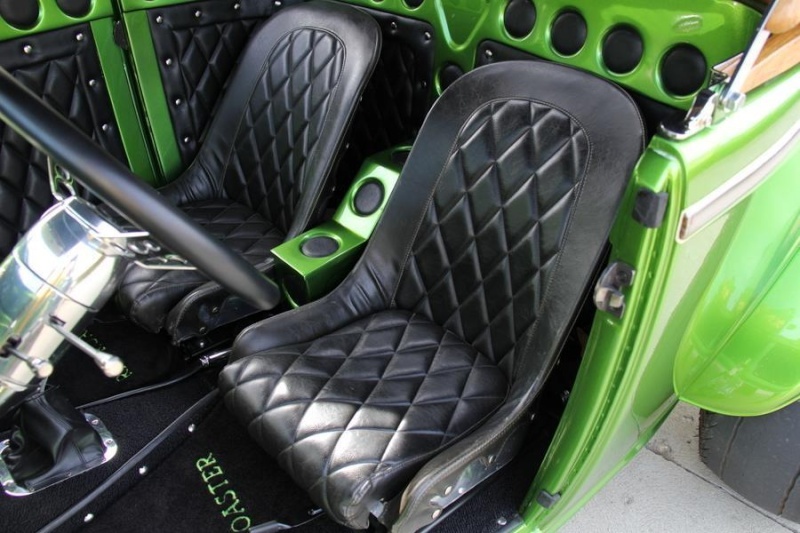 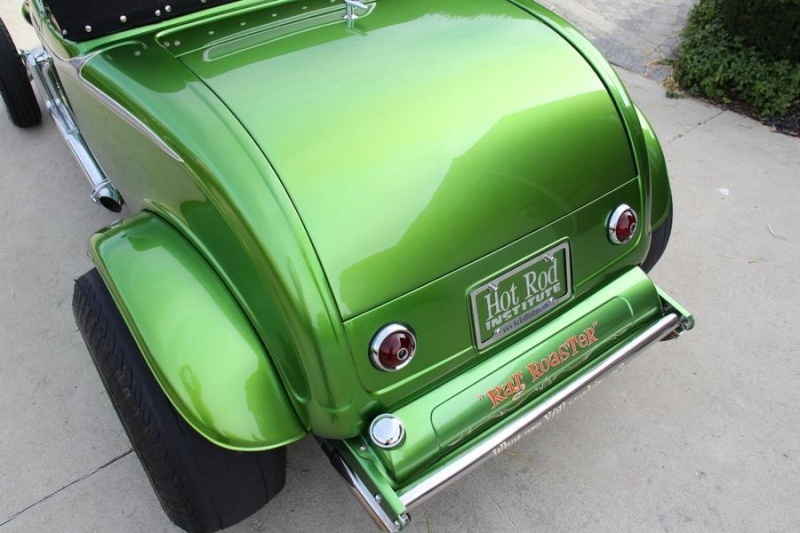 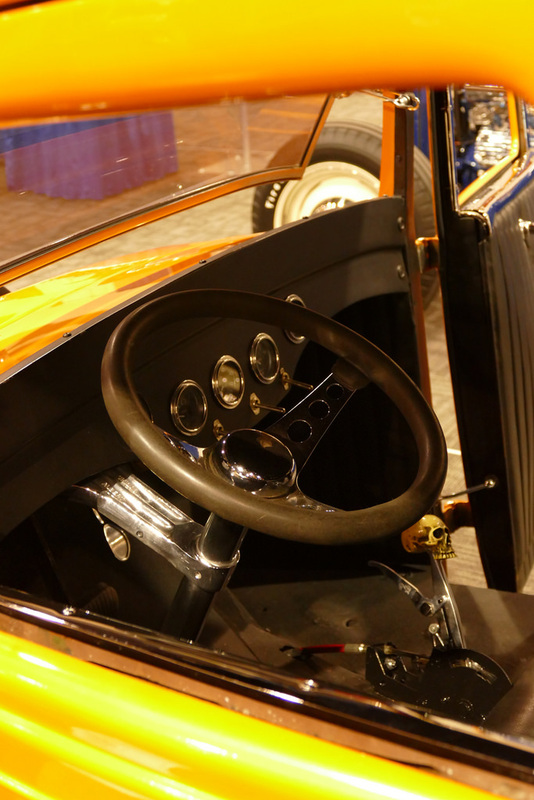 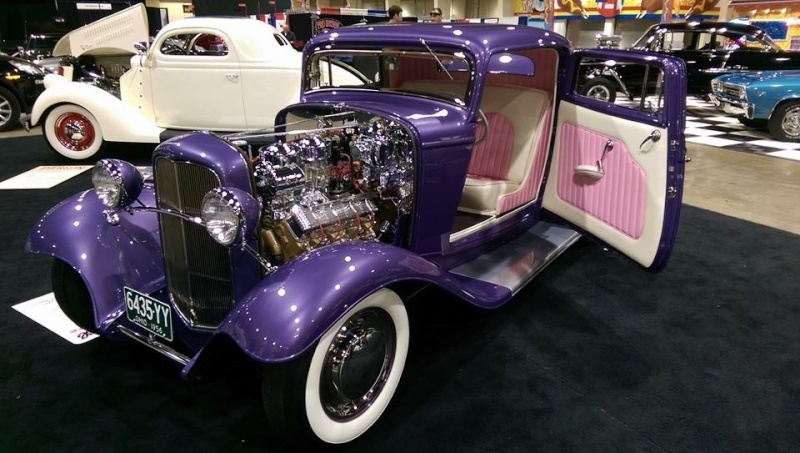 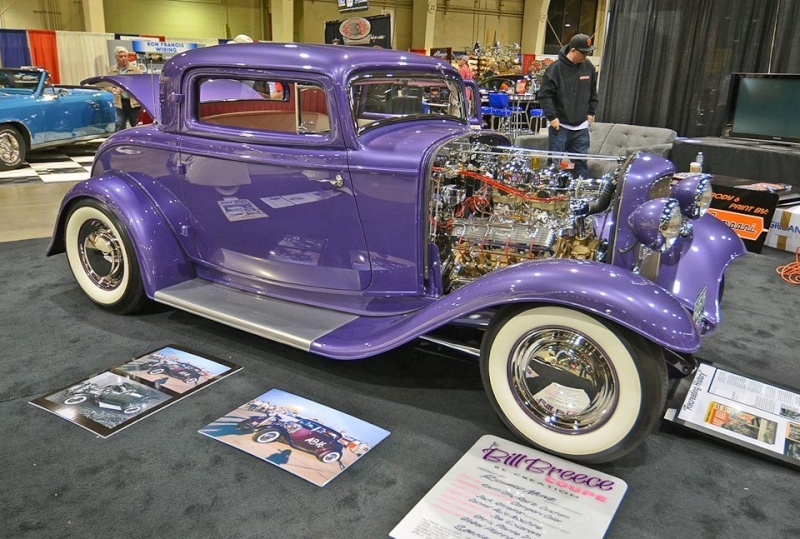 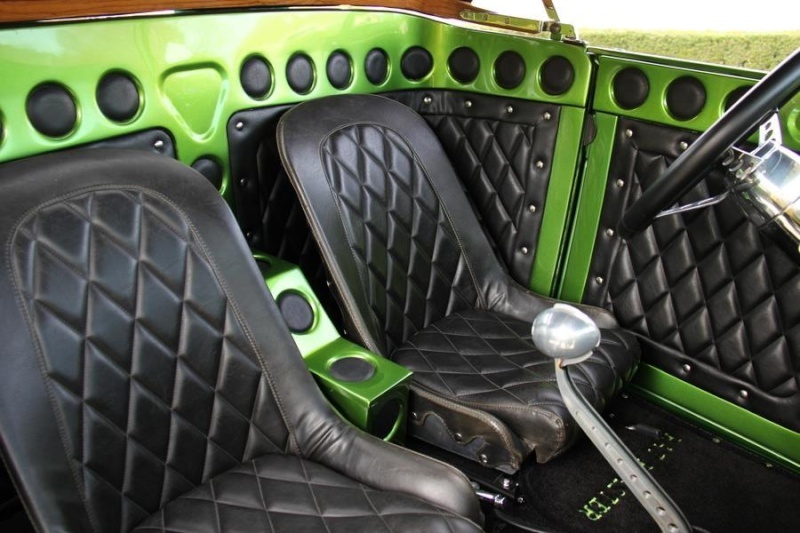 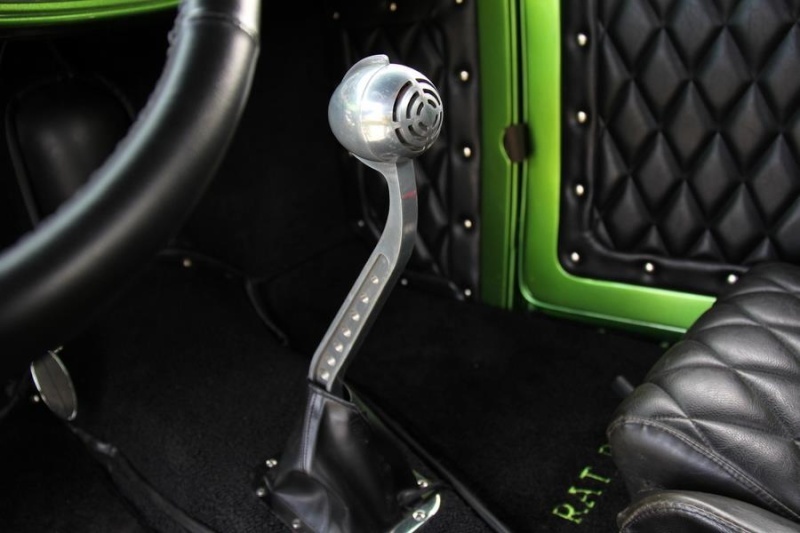 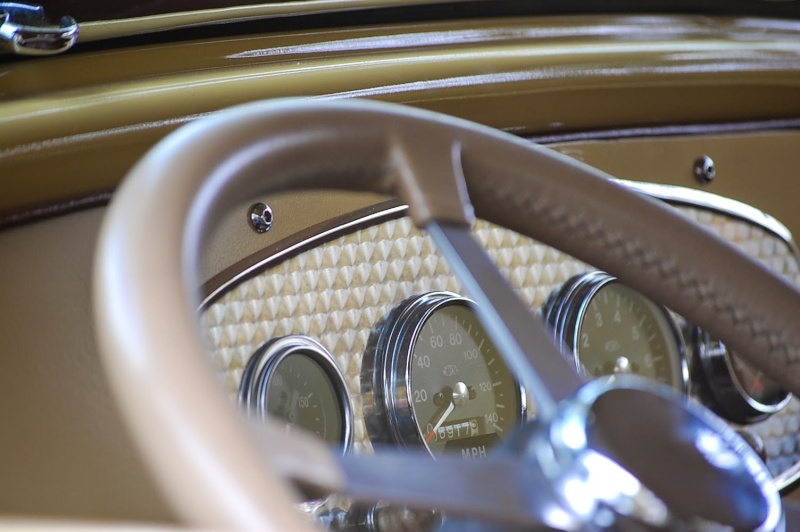 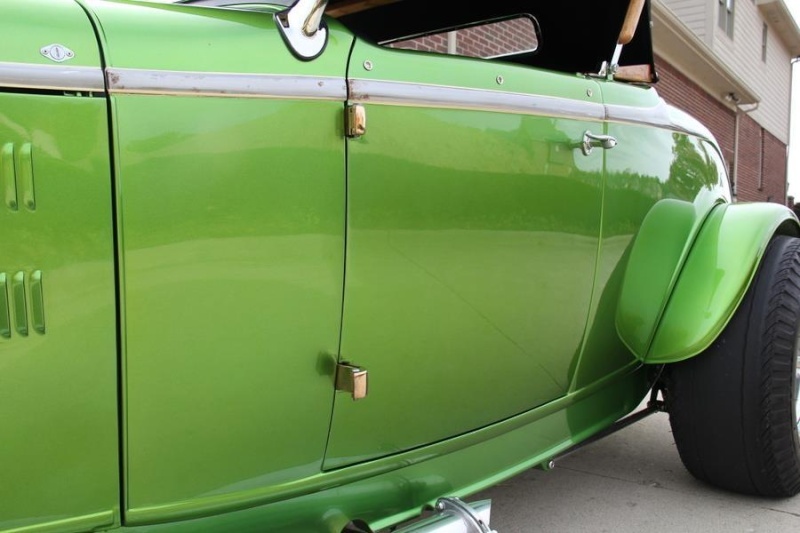 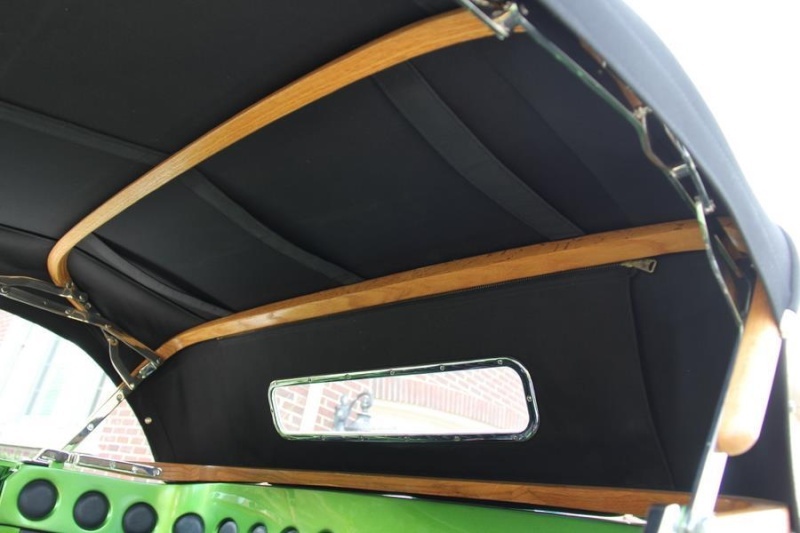 “The trend in Hot Rodding for the last few years has been to build a car that had a ‘40’s or 50’svibe to it... And that’s a cool look. 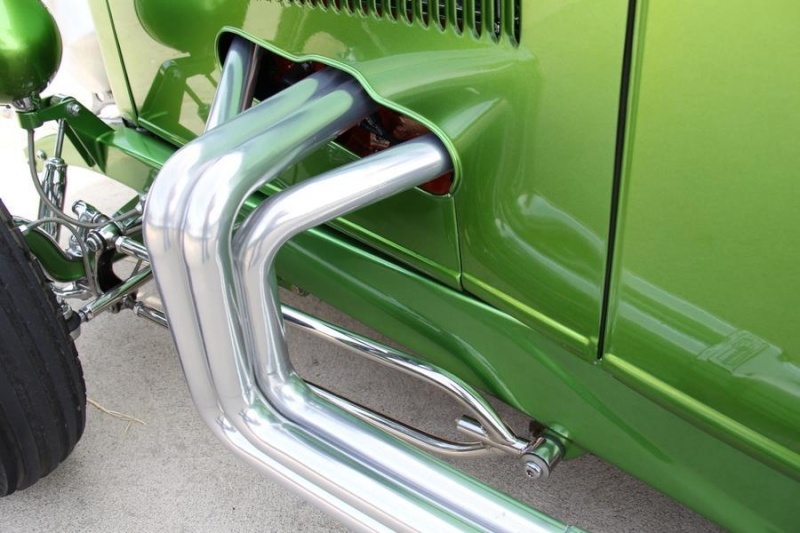 However, I have always liked the late‘60’s era when Drag Racing was King and you had some really wild things running down the strip like Blown front engine dragsters. 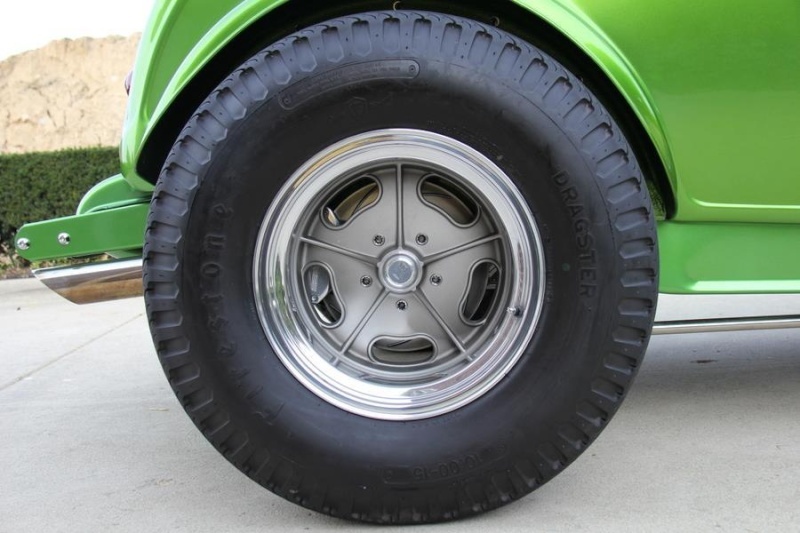 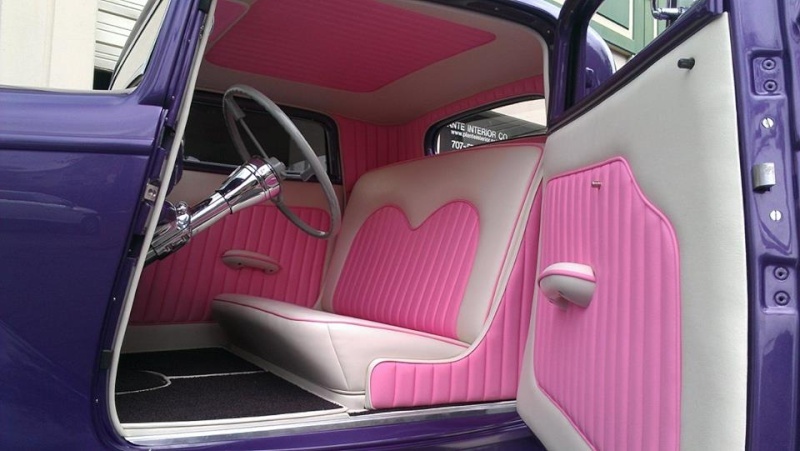 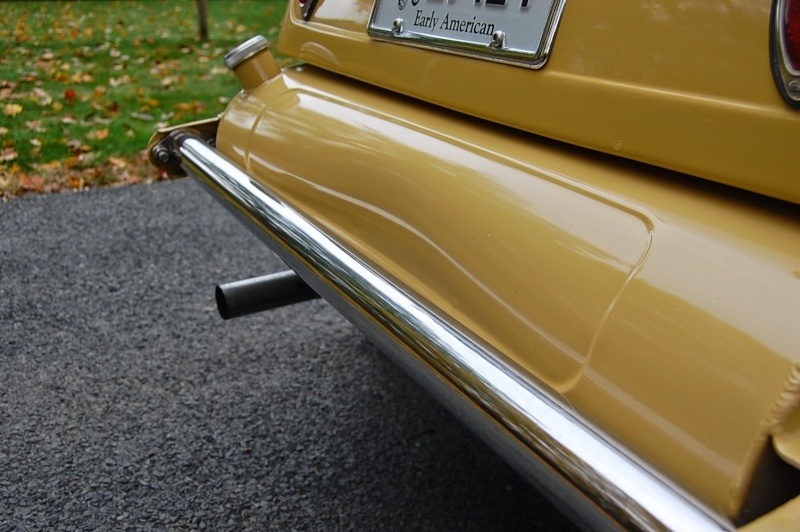 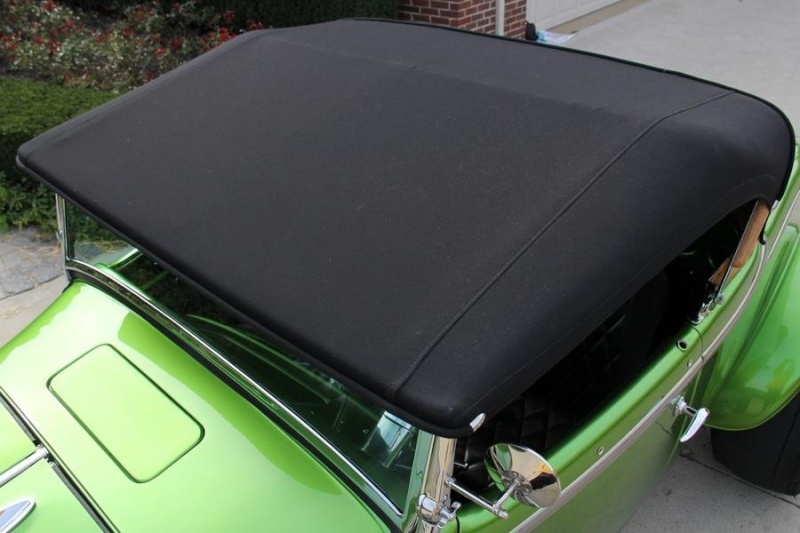 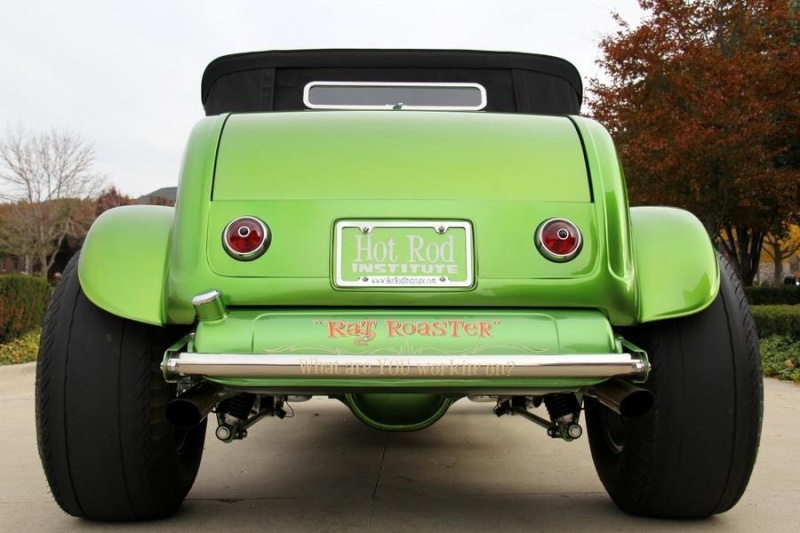 During this time, their weren’t a lot of Hot Rods roaming the streets because the Musclecar was King. 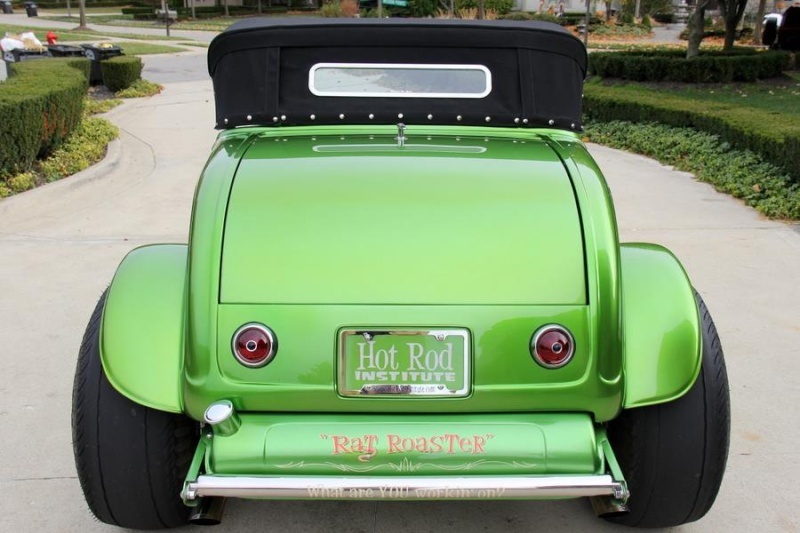 So the idea behind the Rat Roaster was to take the thought of American Graffiti and drop in into the late ‘60’s instead of the early 60’s. 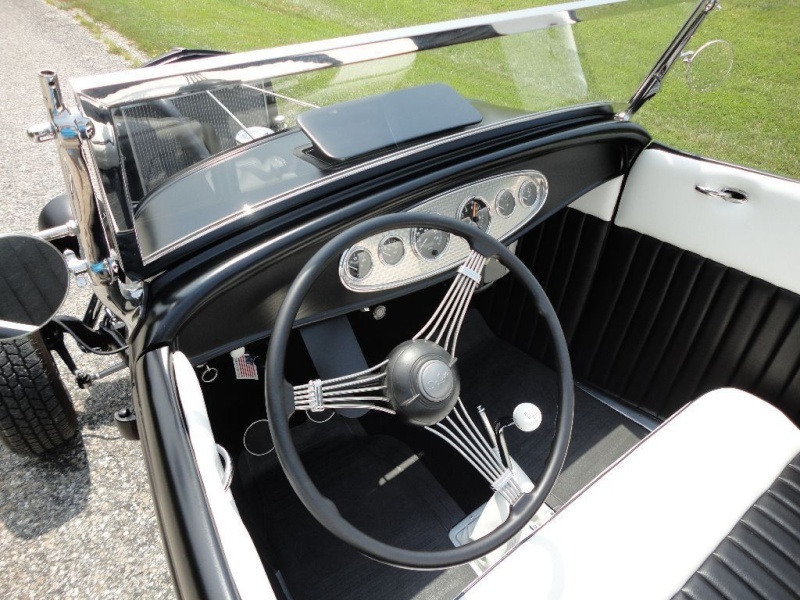 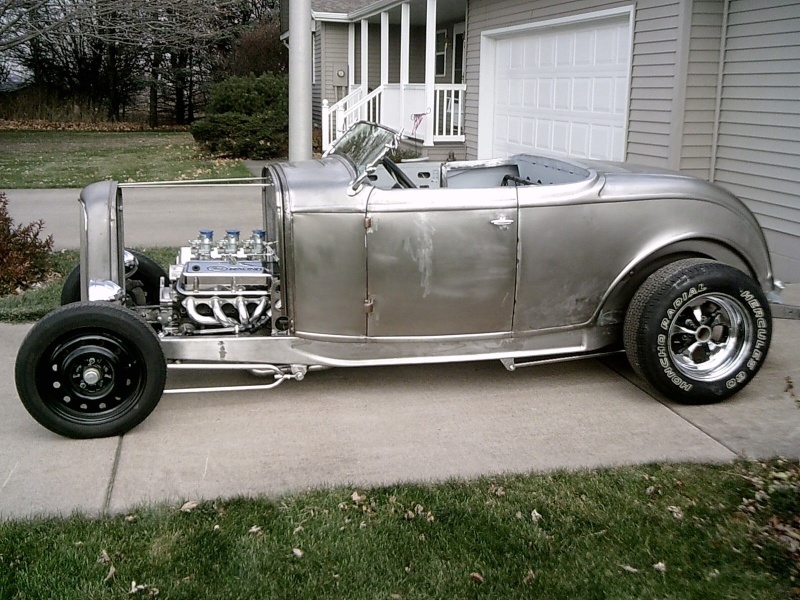 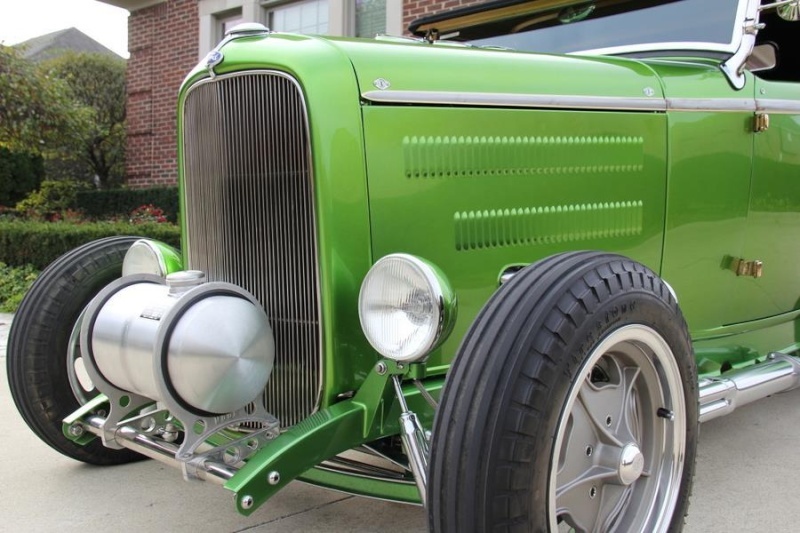 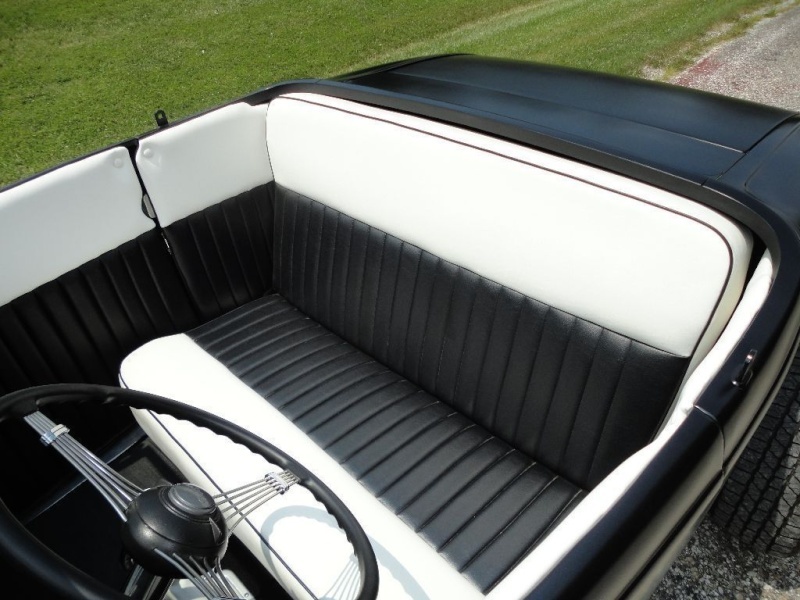 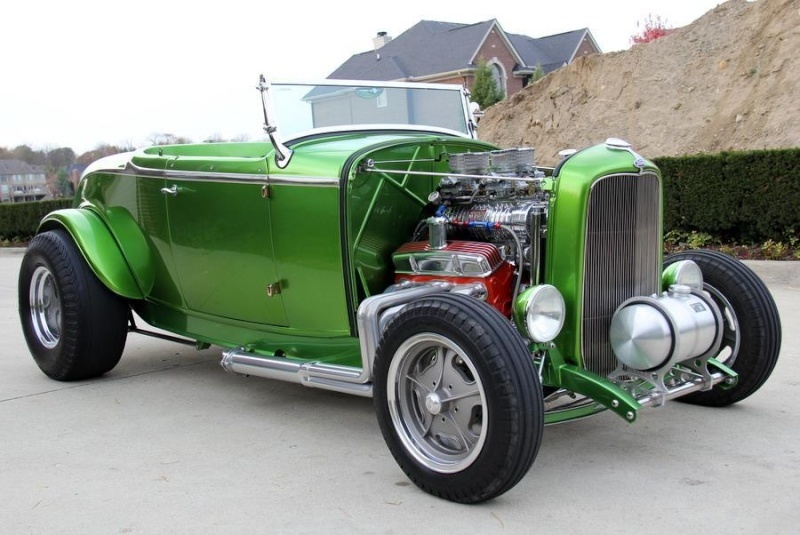 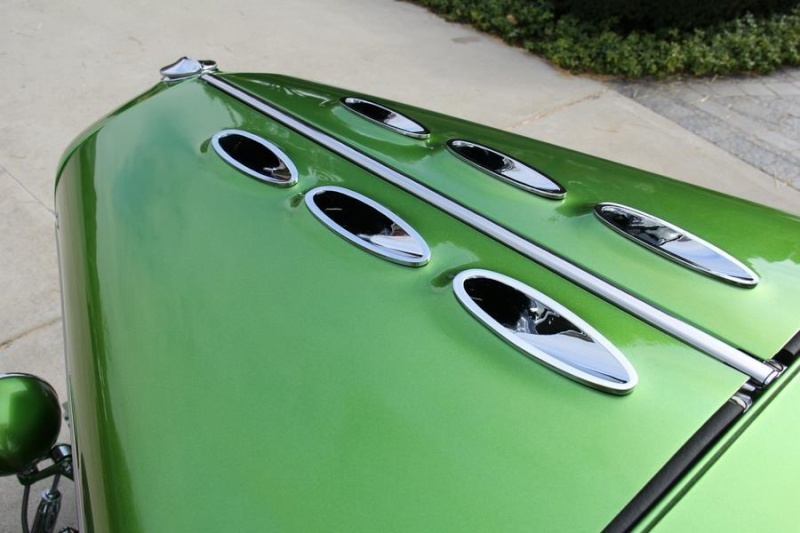 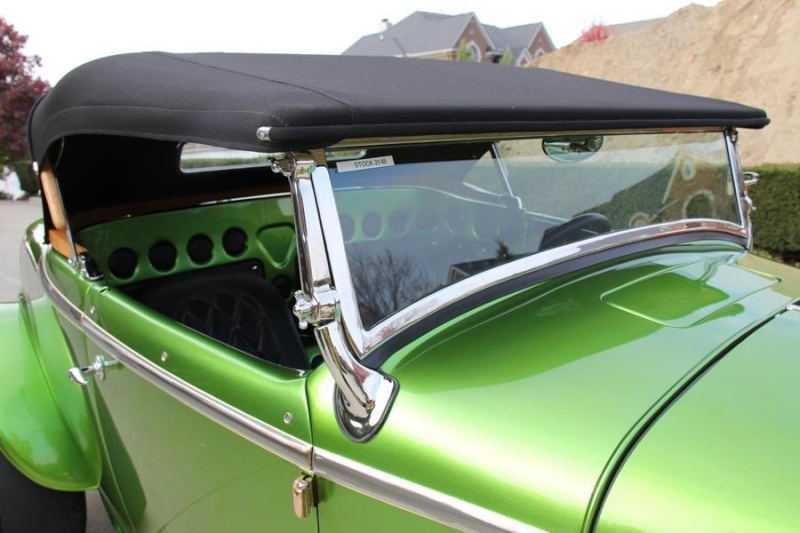 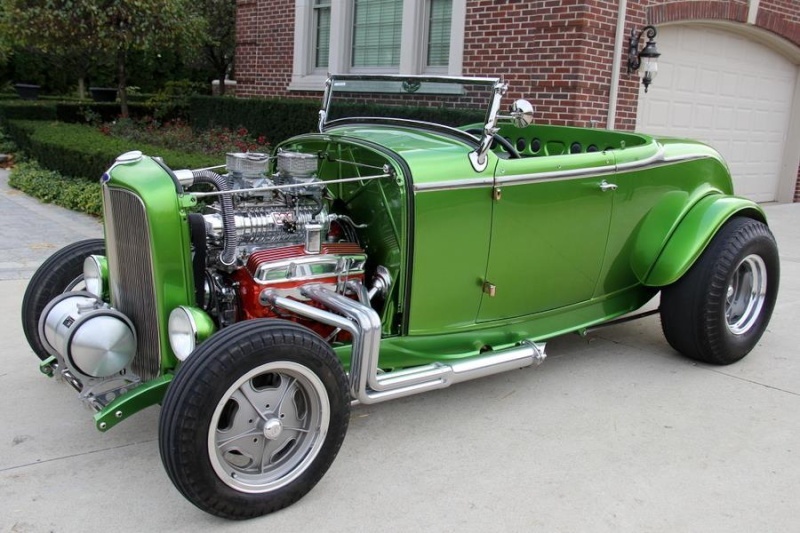 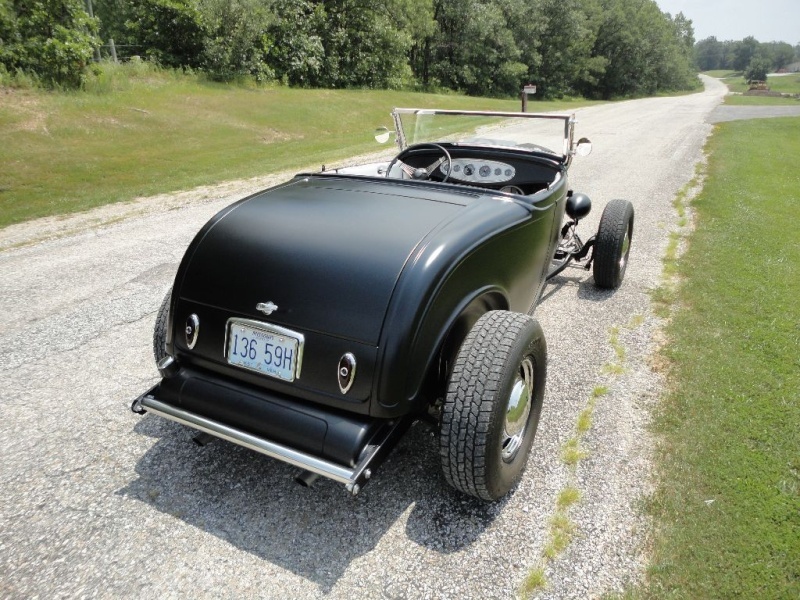 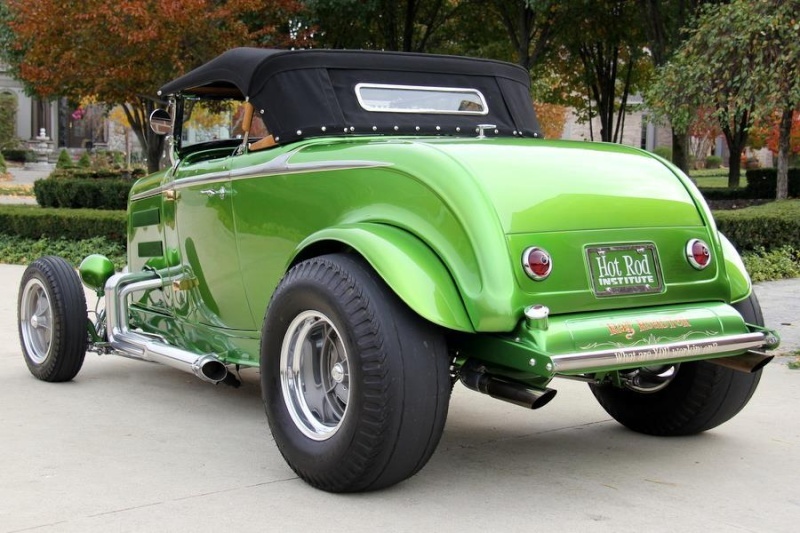 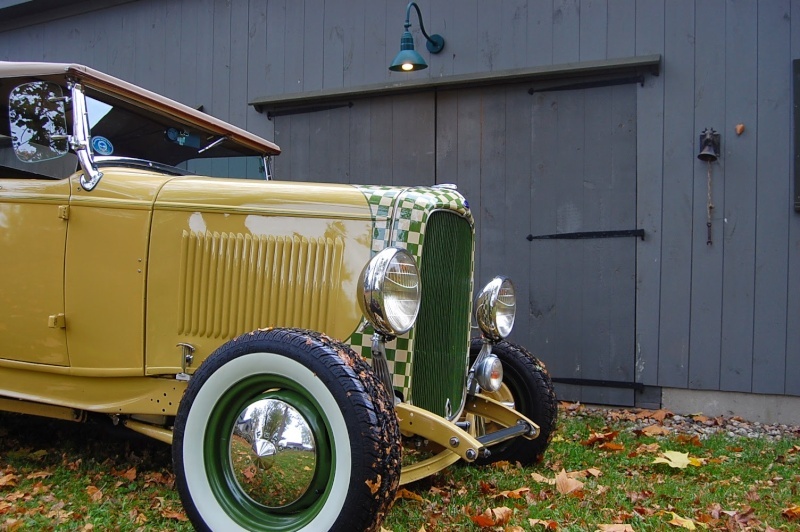 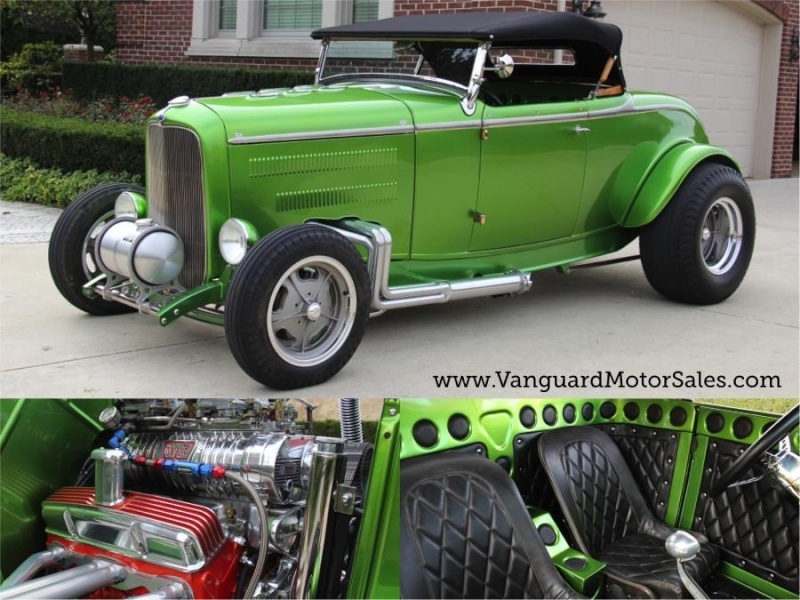 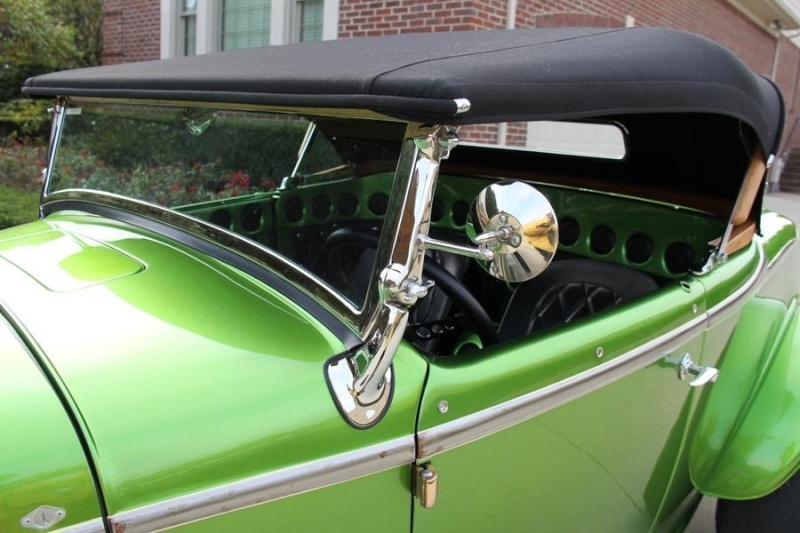 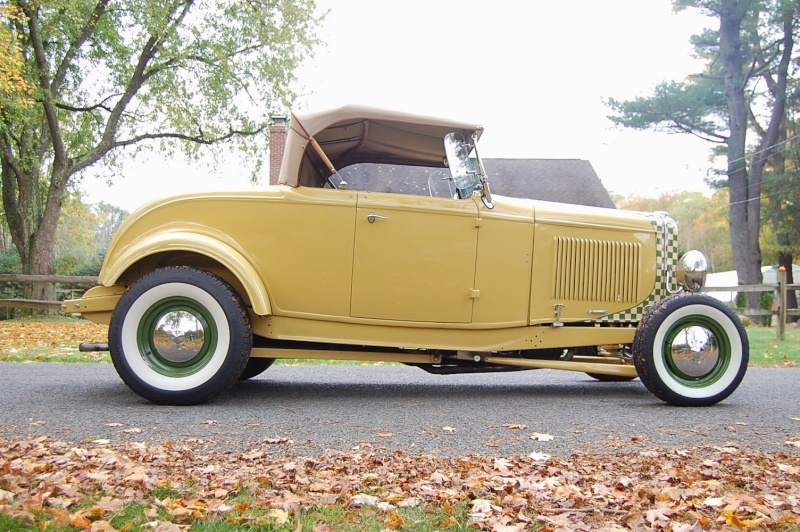 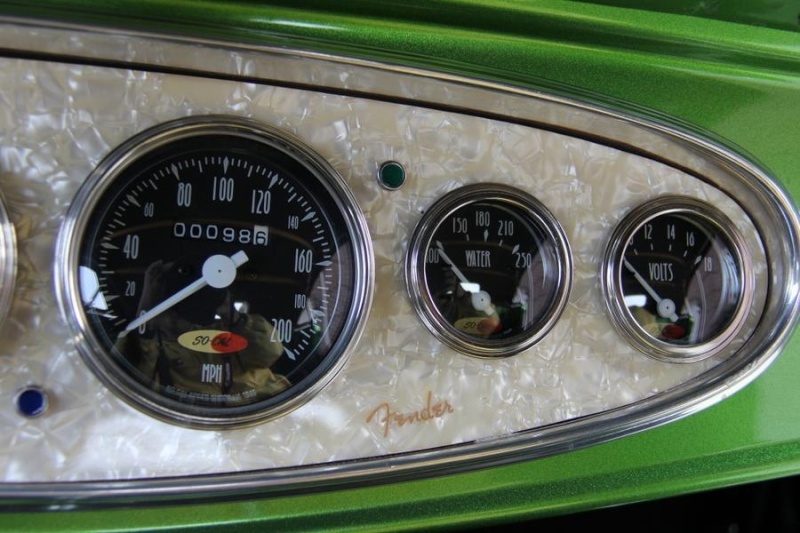 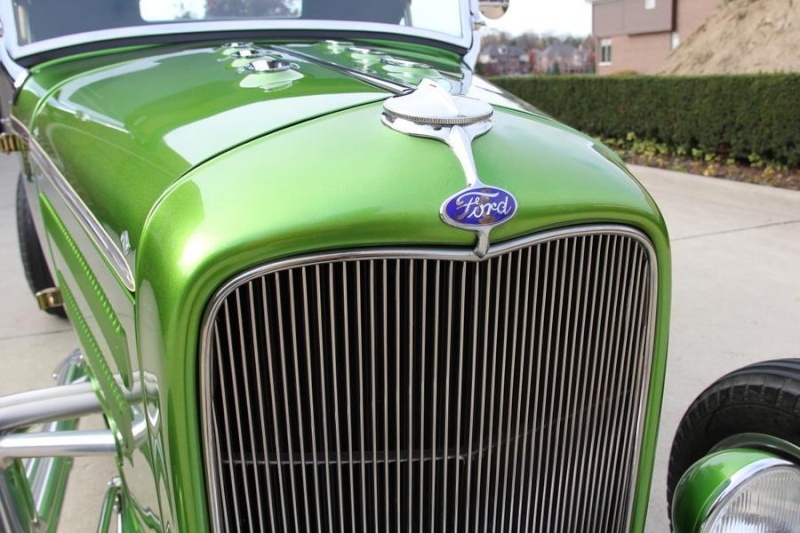 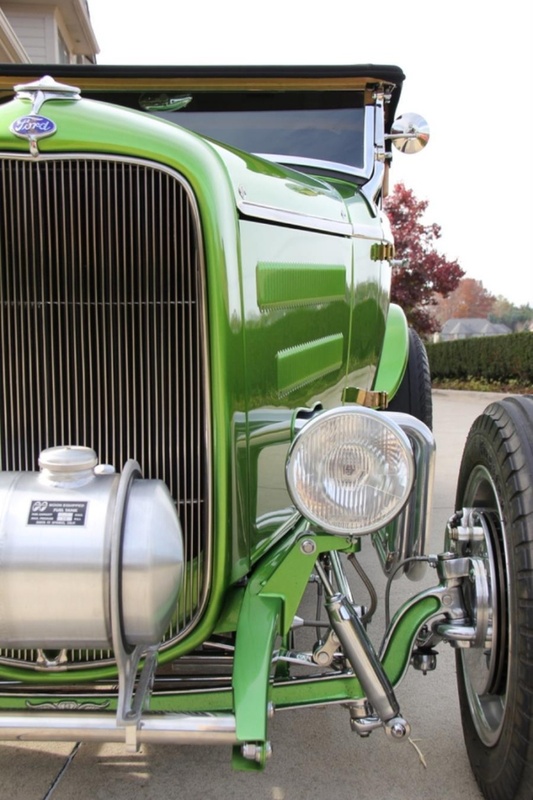 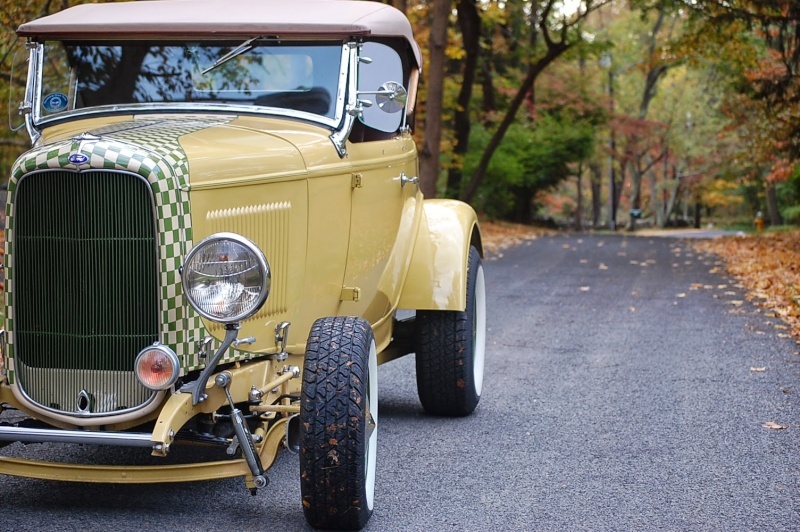 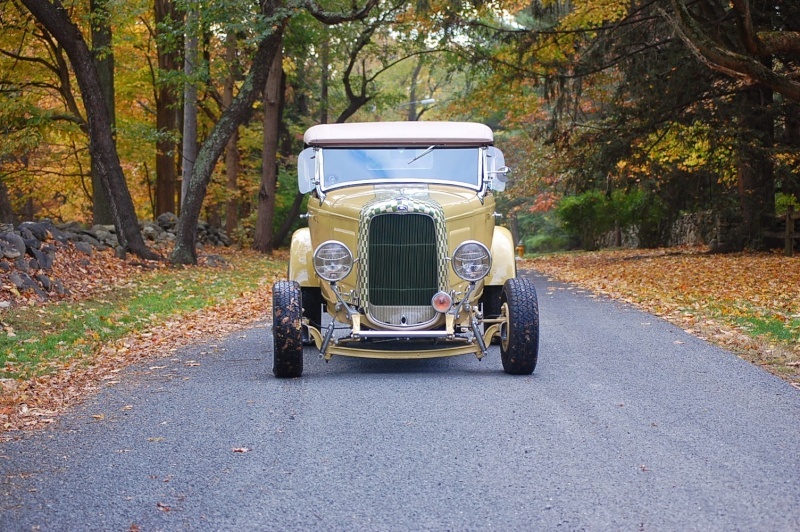 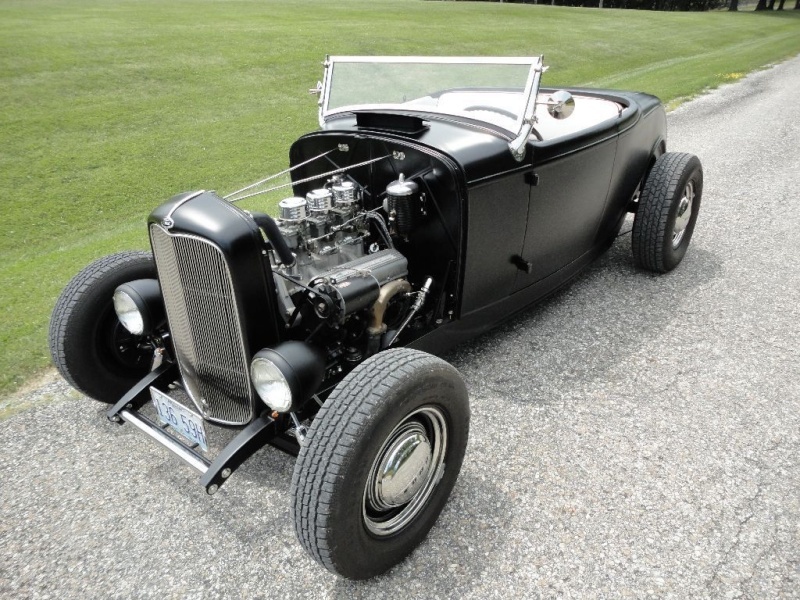 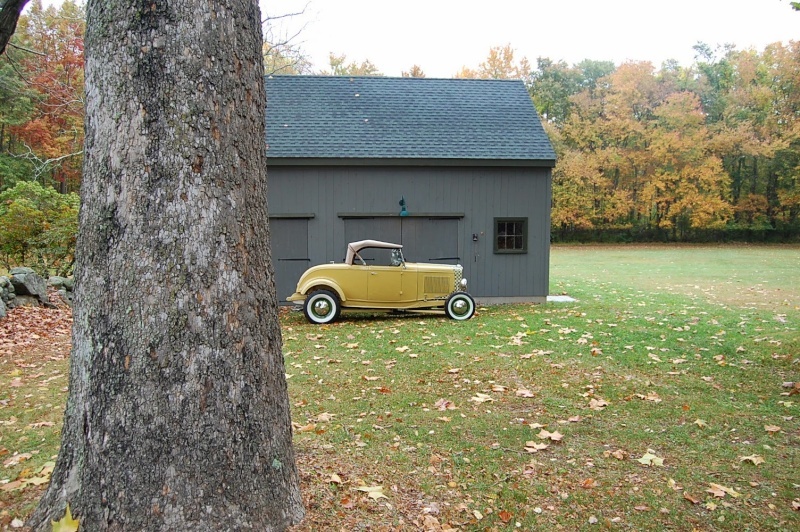 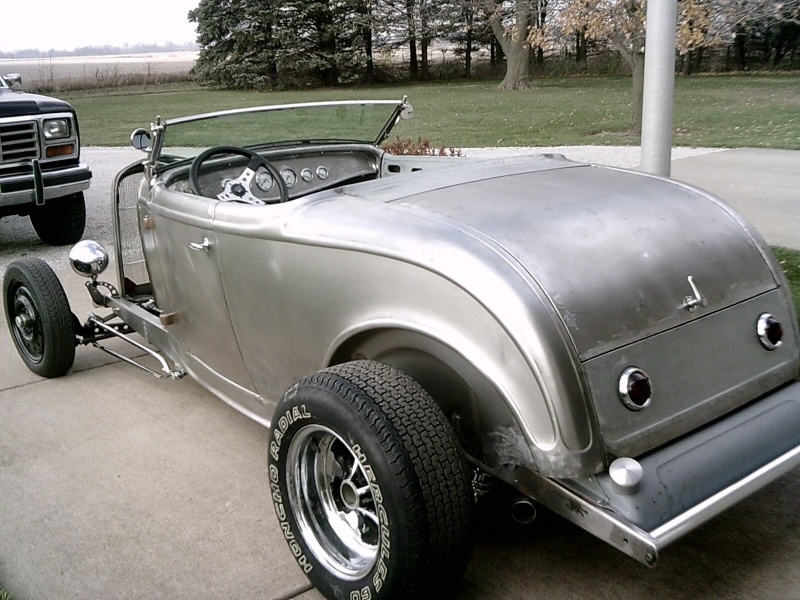 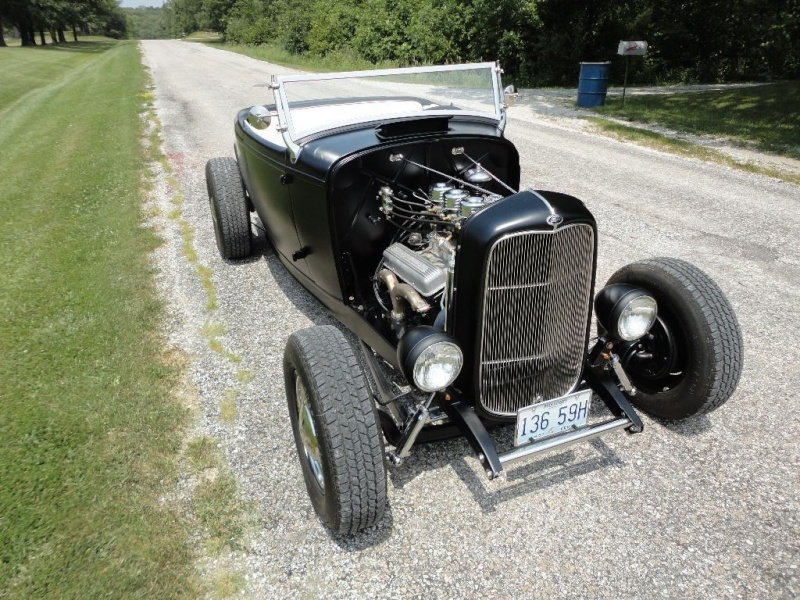 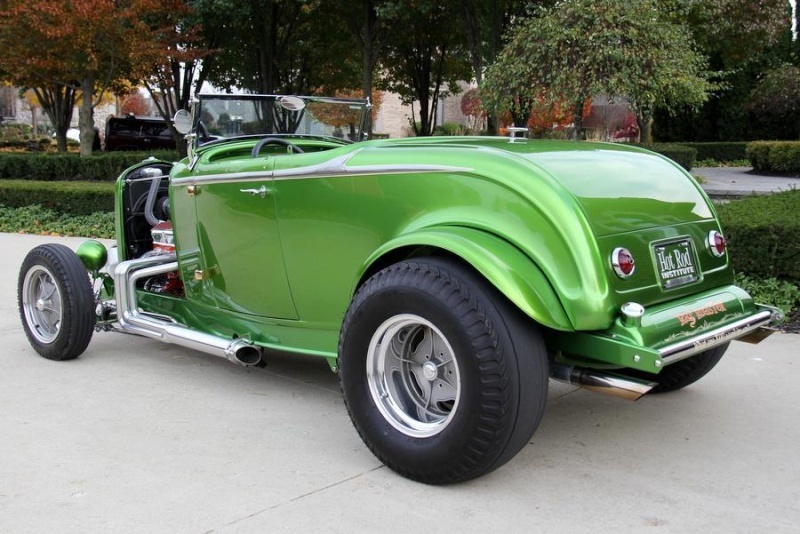 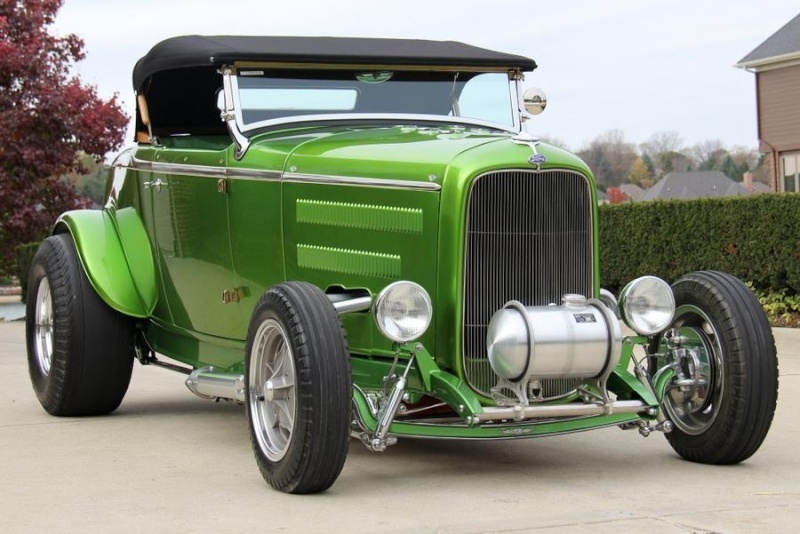 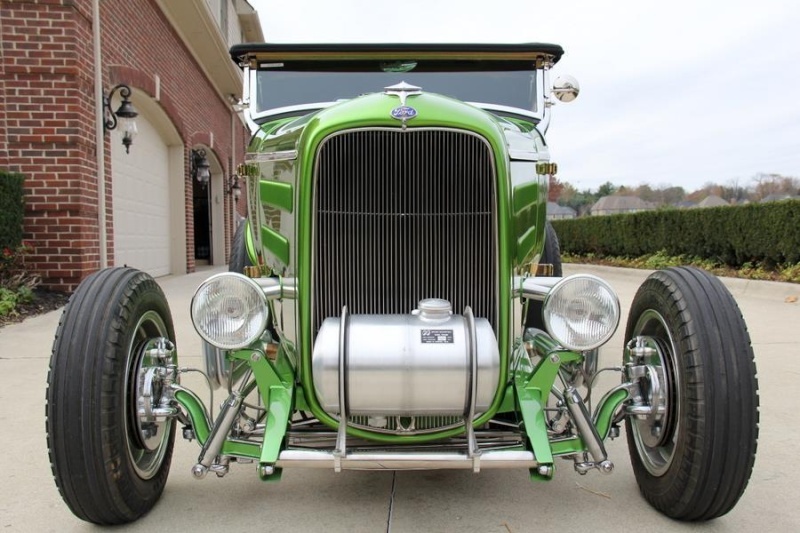 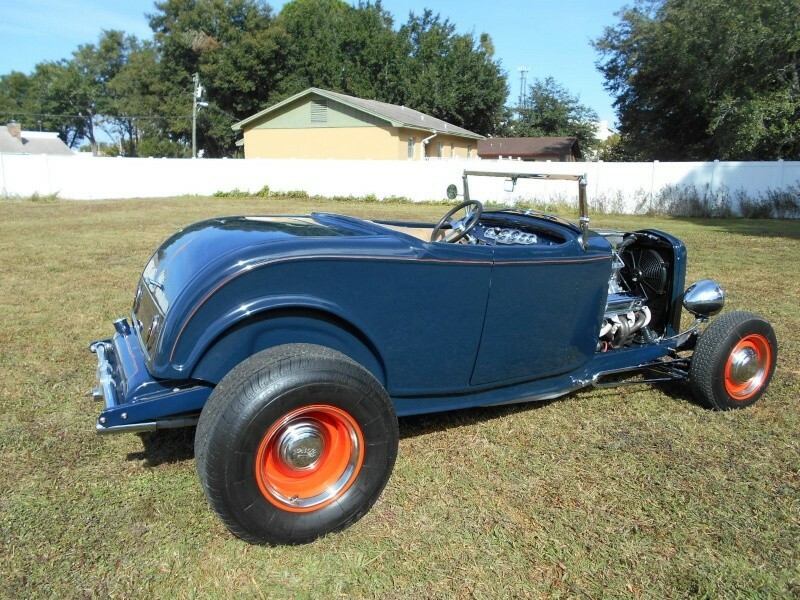 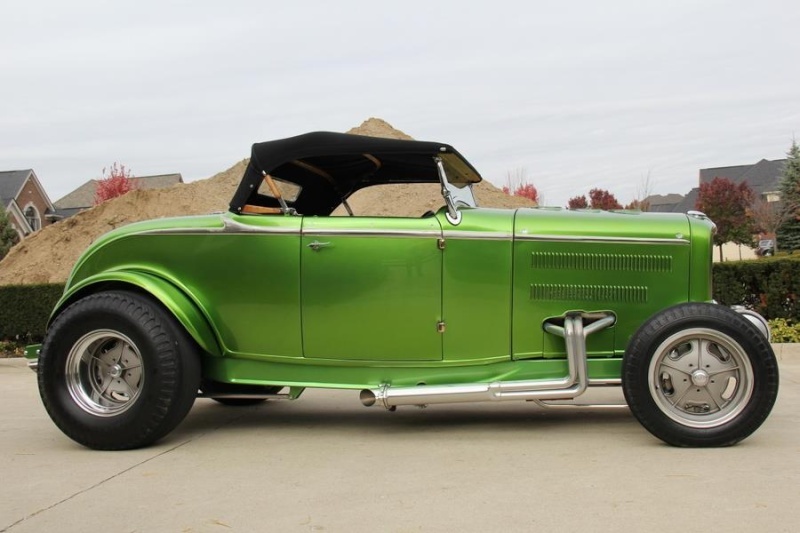 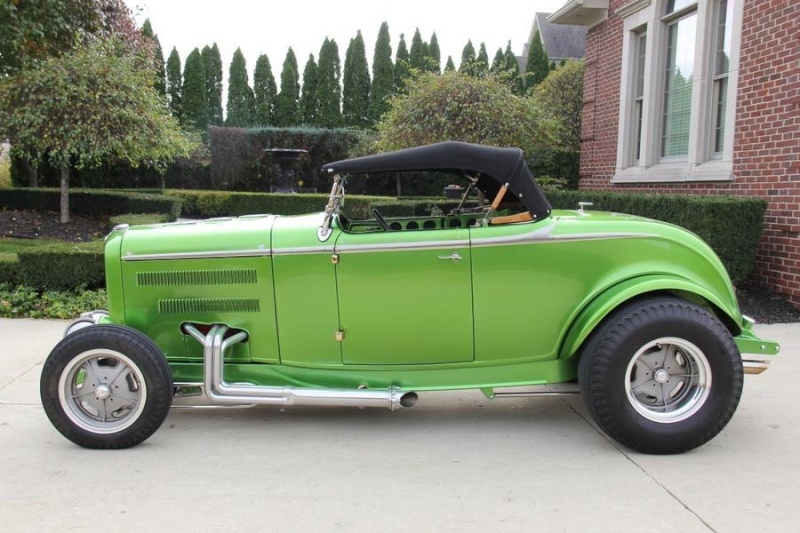 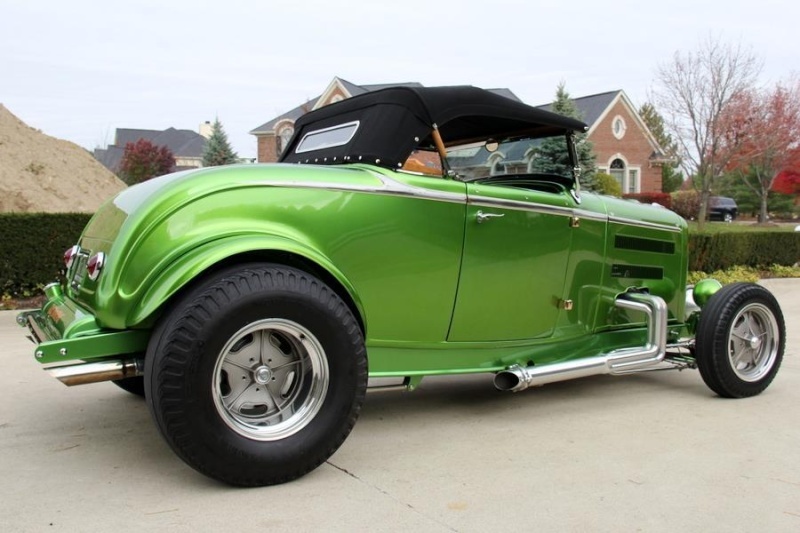 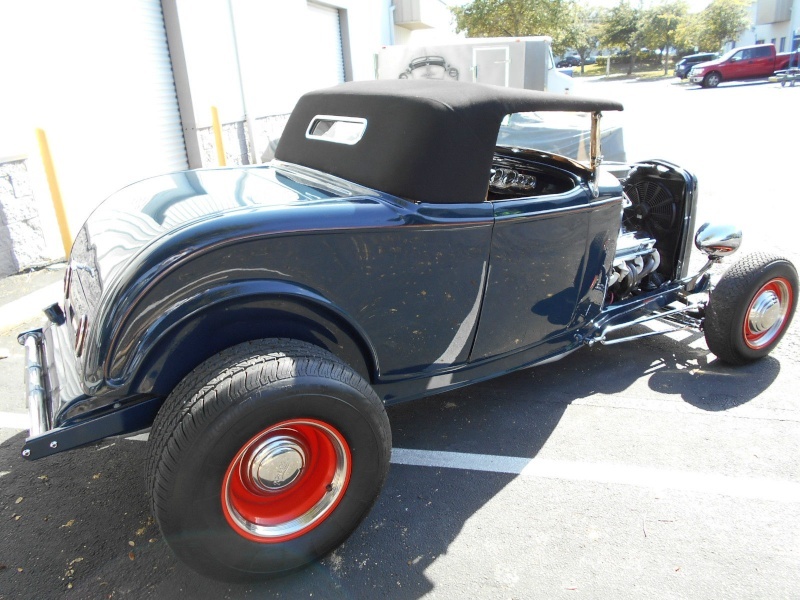 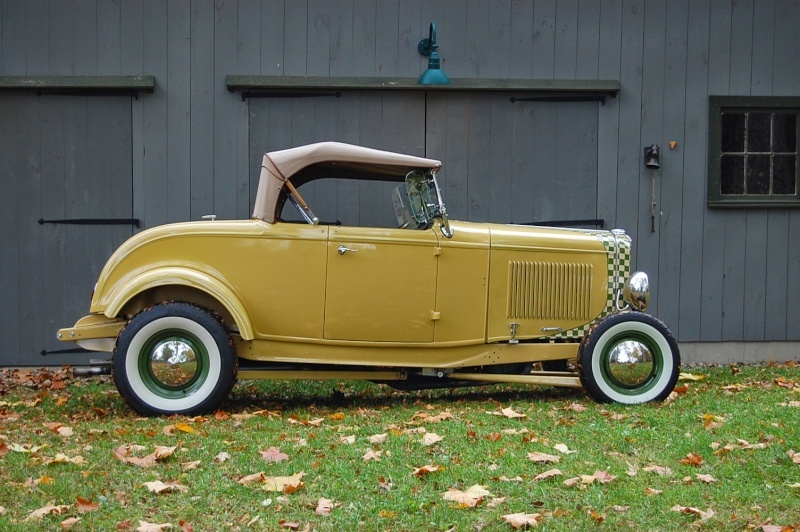 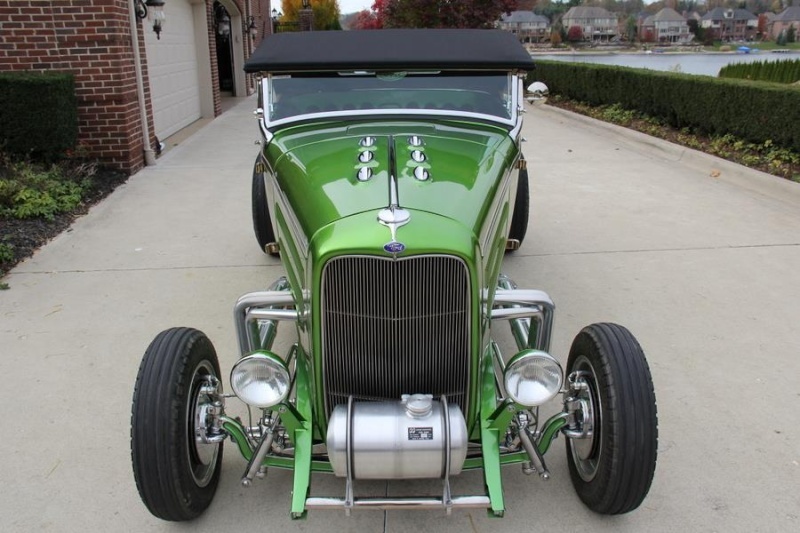 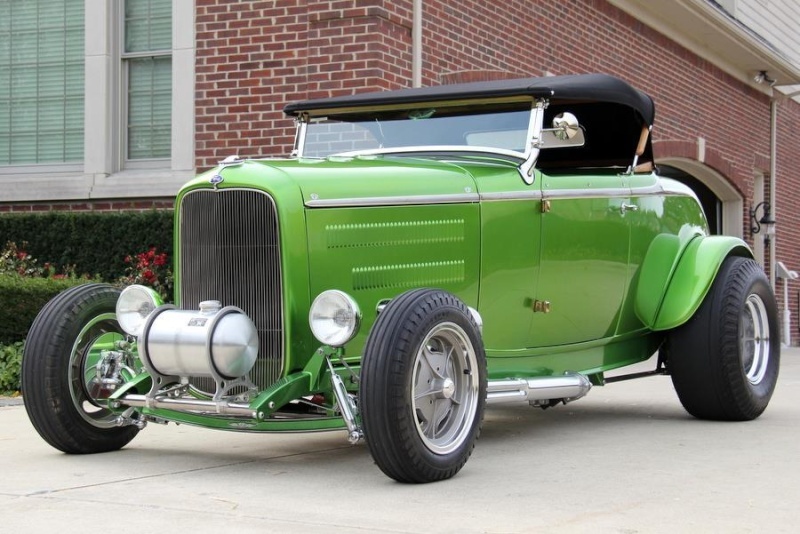 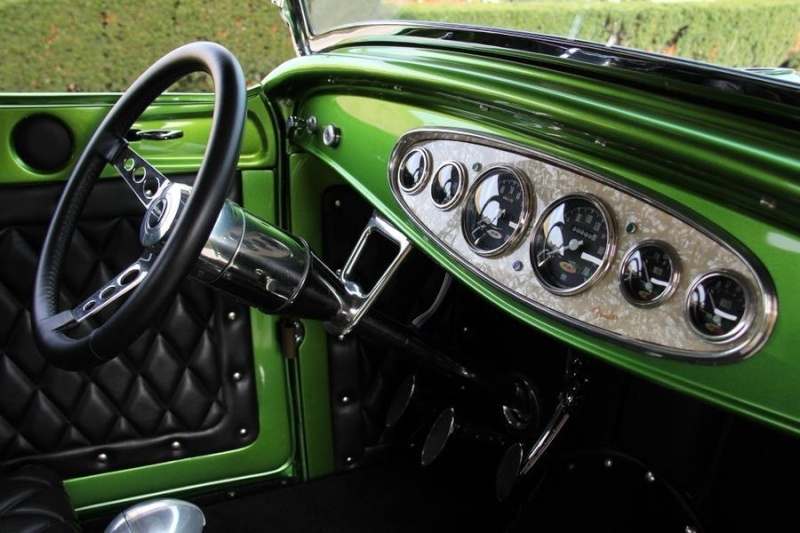 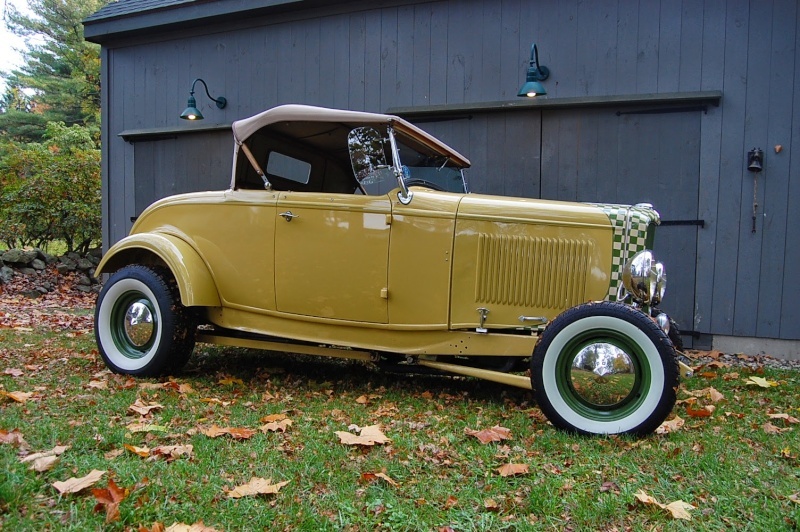 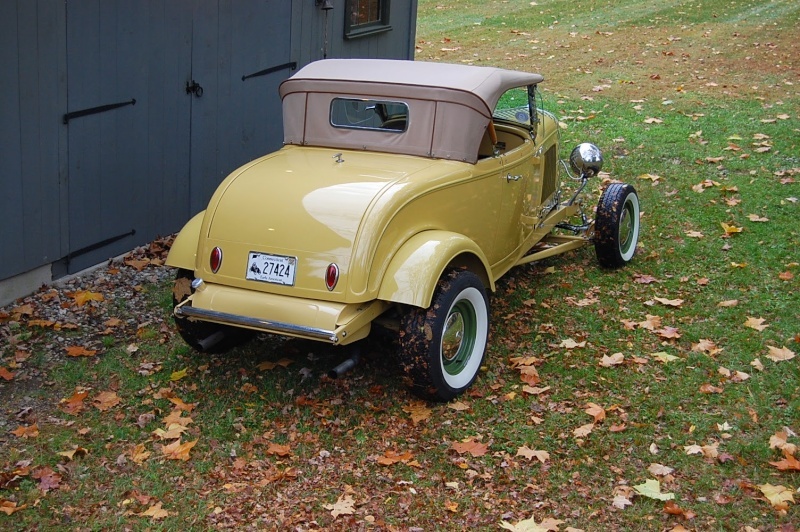 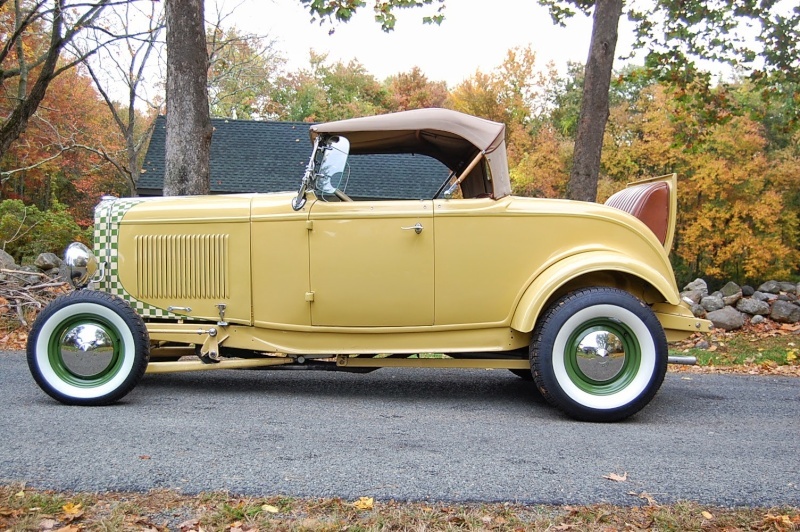 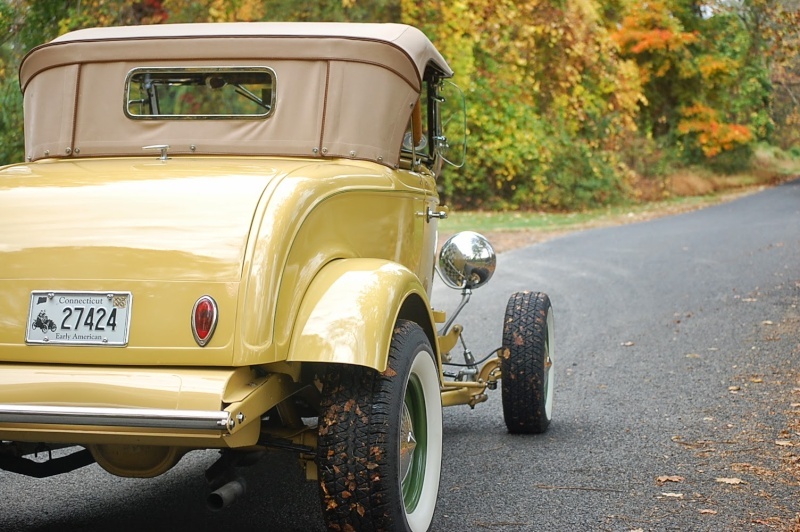 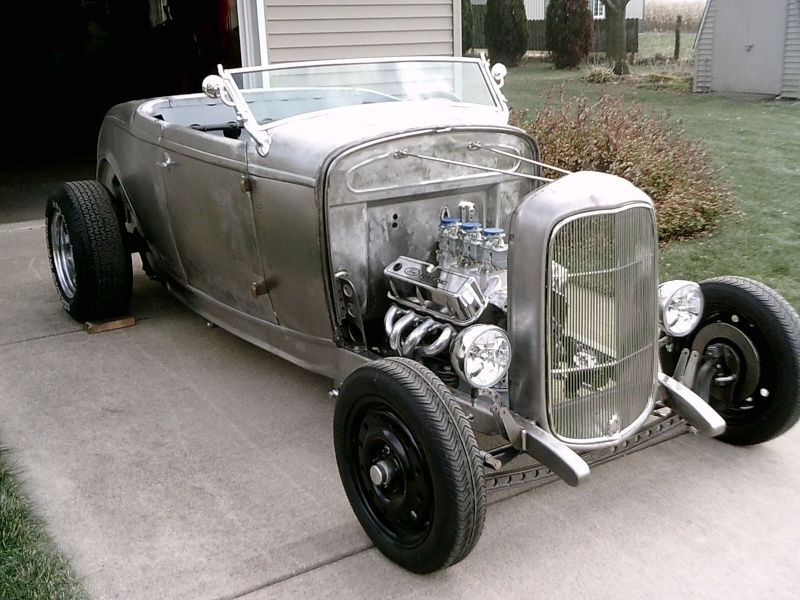 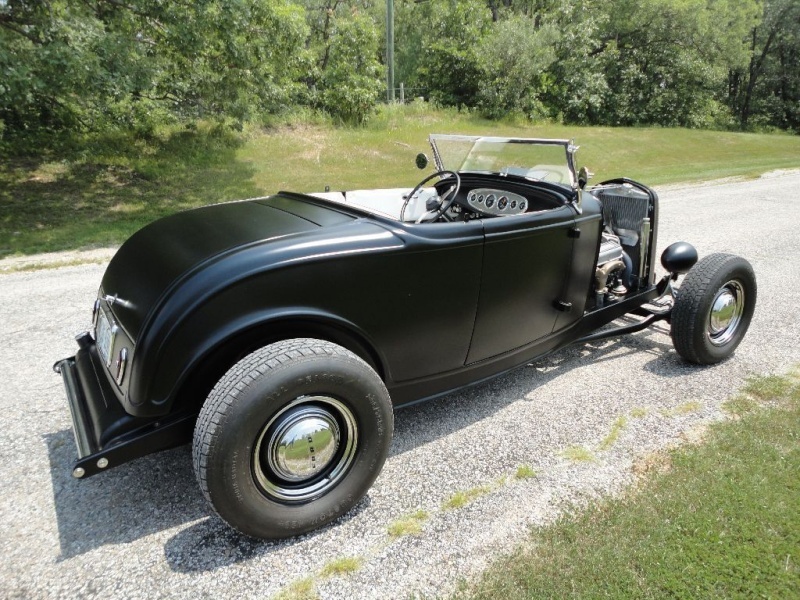 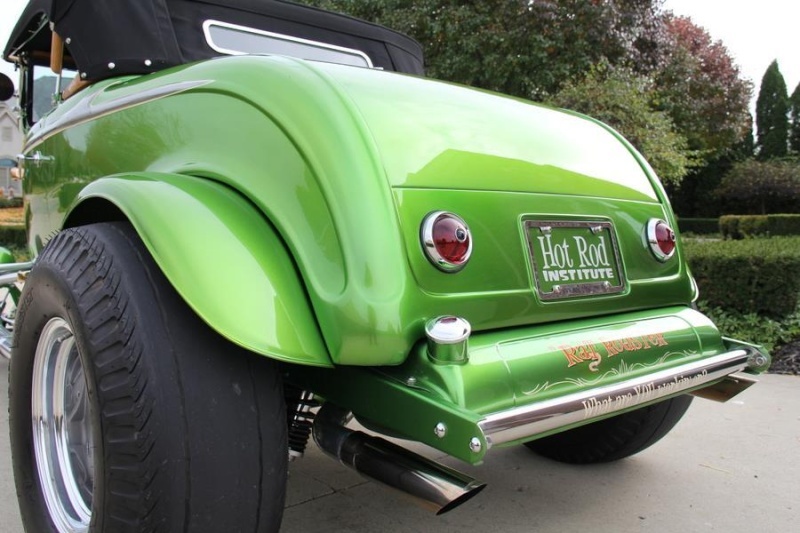 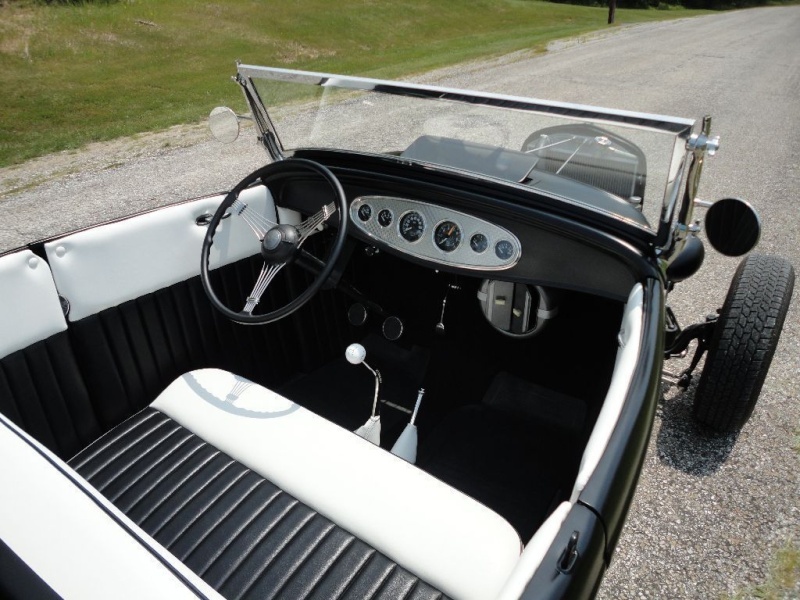 If the Baddest car in the Valley in 1969 was a ’32 Ford roadster,... what would it have looked like? 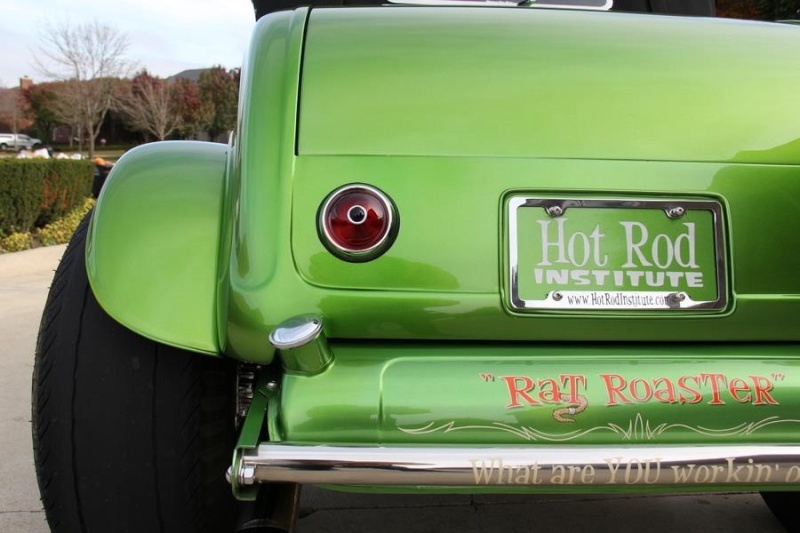 The Rat Roaster was designed to be THAT car. 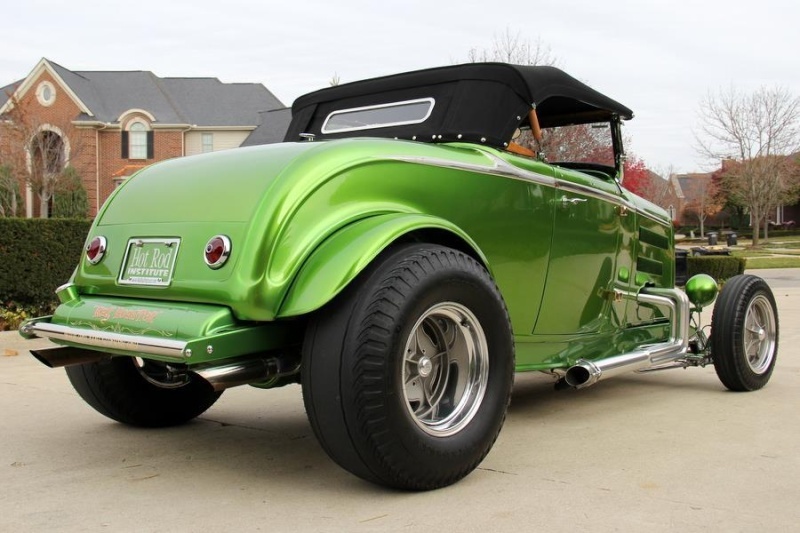 The criteria was pretty simple, number one...It would have to be something that would out run the hottest Muscle car on the street or strip by at least a second or two.Number two... 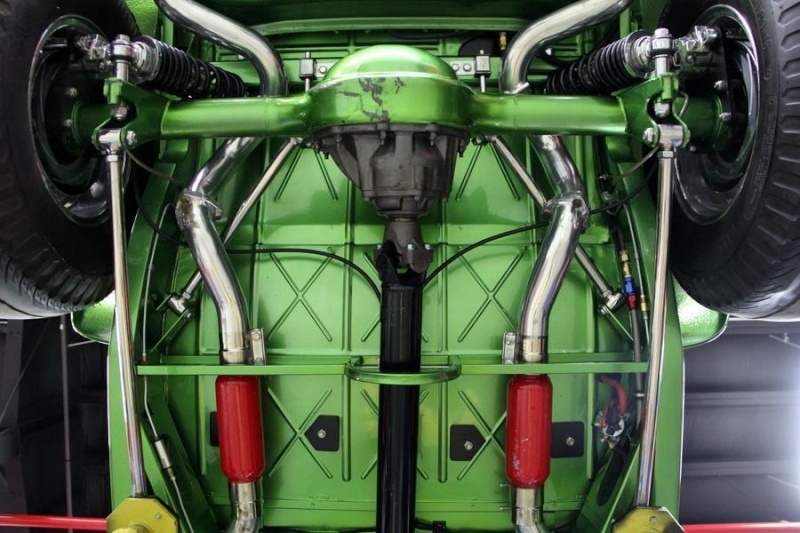 It would have to have enough “WOW” in the engine to make people walk past Hemi’s and Tri-powers to come and stare at it. 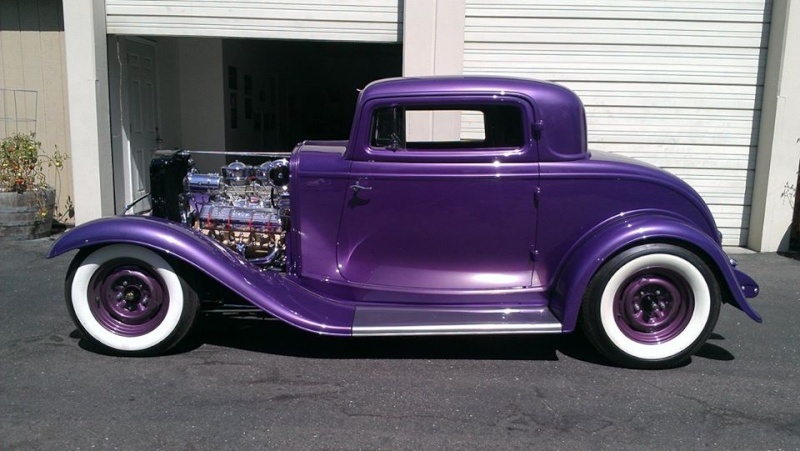 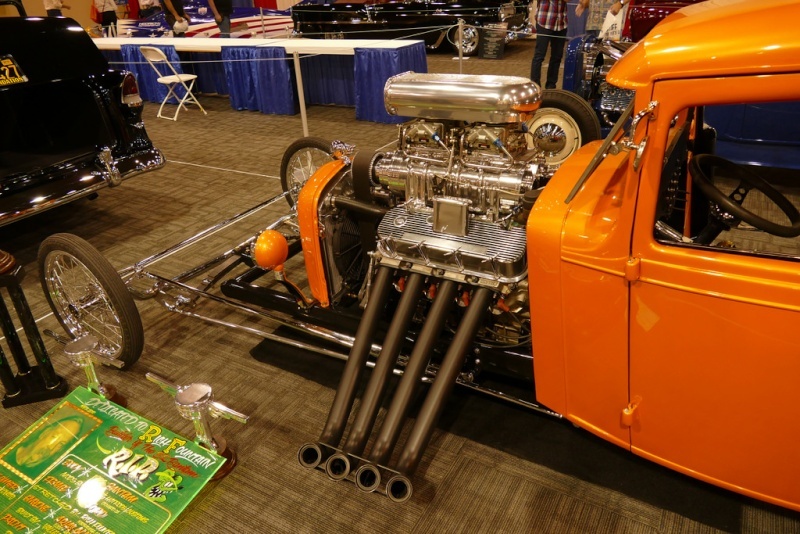 Number three... it would still have to be affordable for a young Hot Rodder to build and own, sono exotic blown Hemi’s or Cammers. 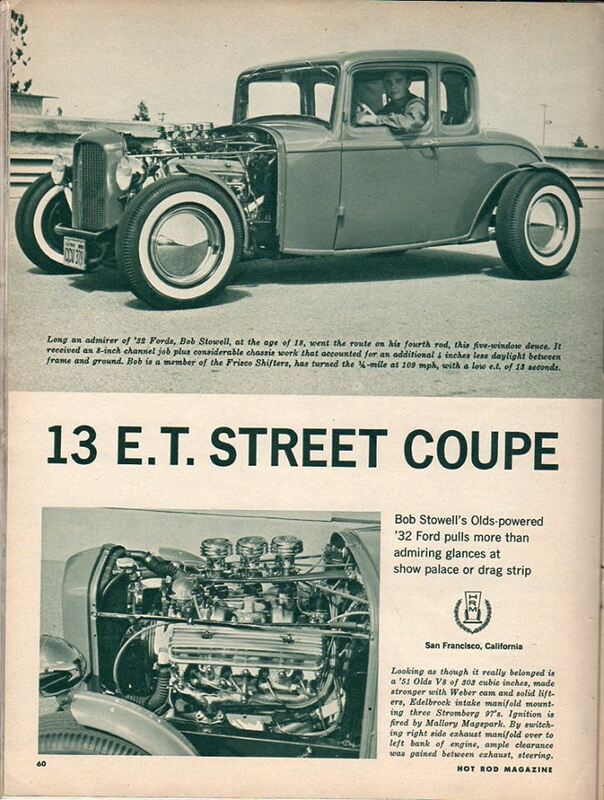 The only engine that would have fulfilled all three of these criteria in 1969 was a blown small-block Chevy. 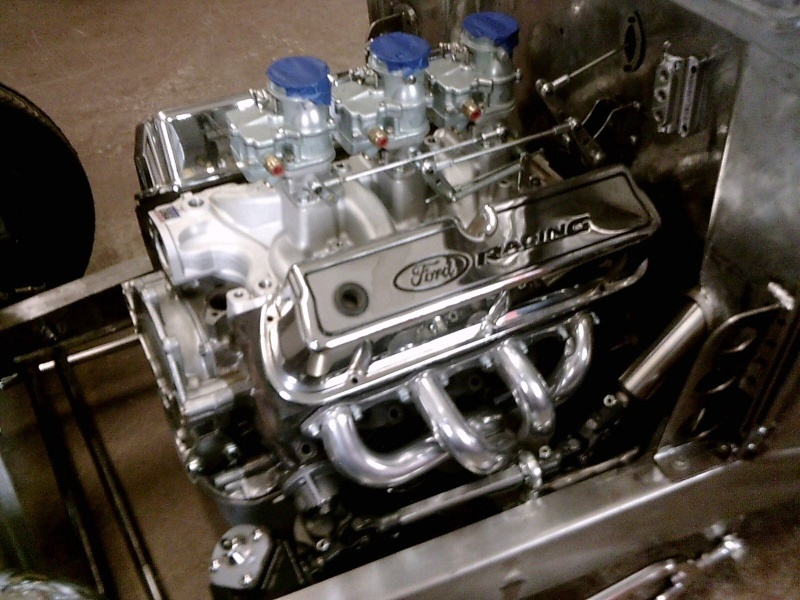 A box of spare parts, paperwork for the build and the dyno test are included in the sale. 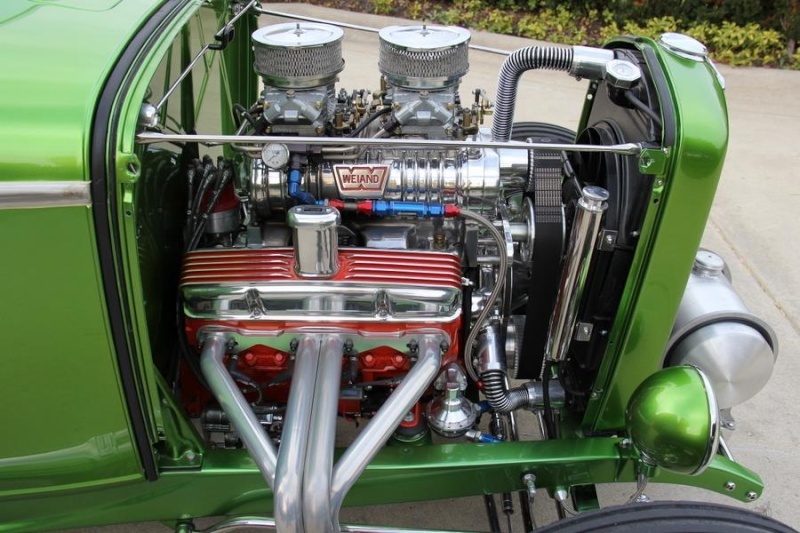 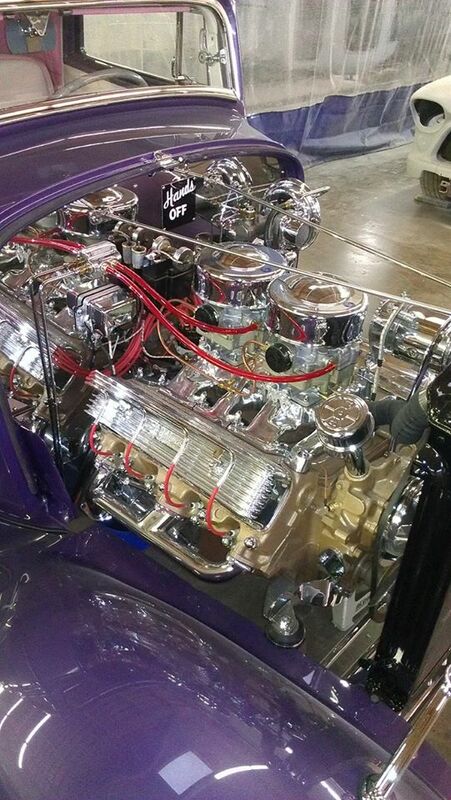 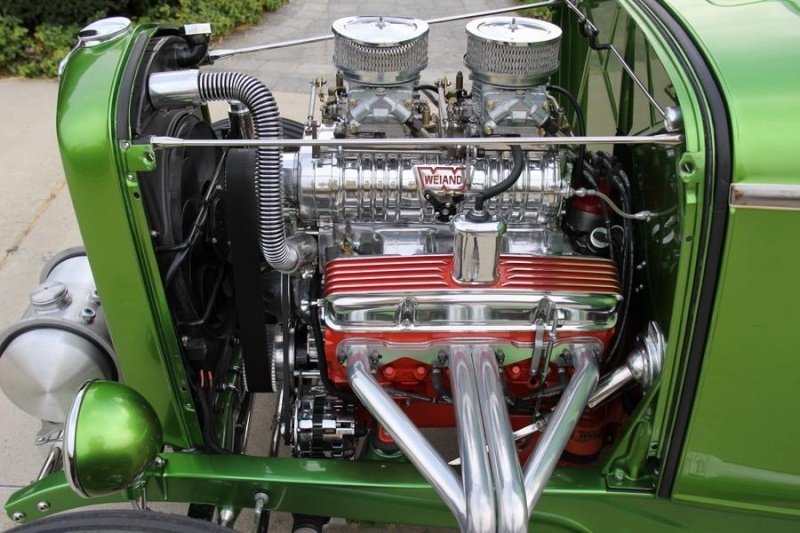 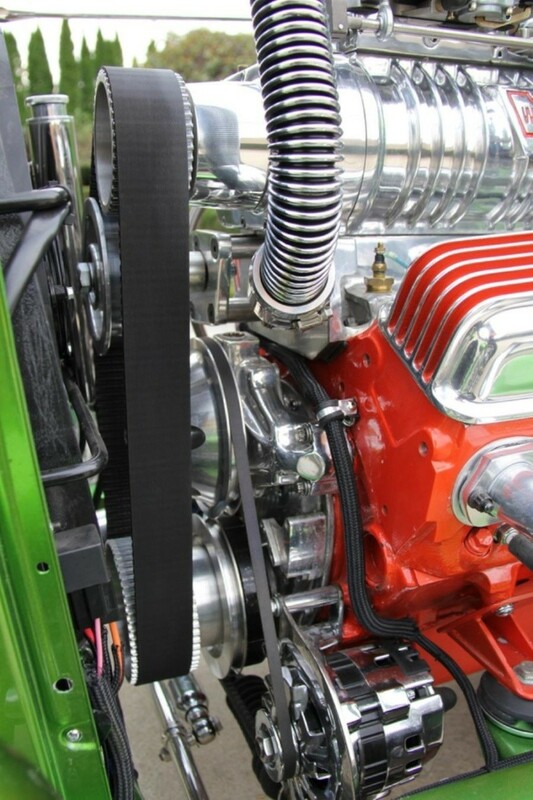 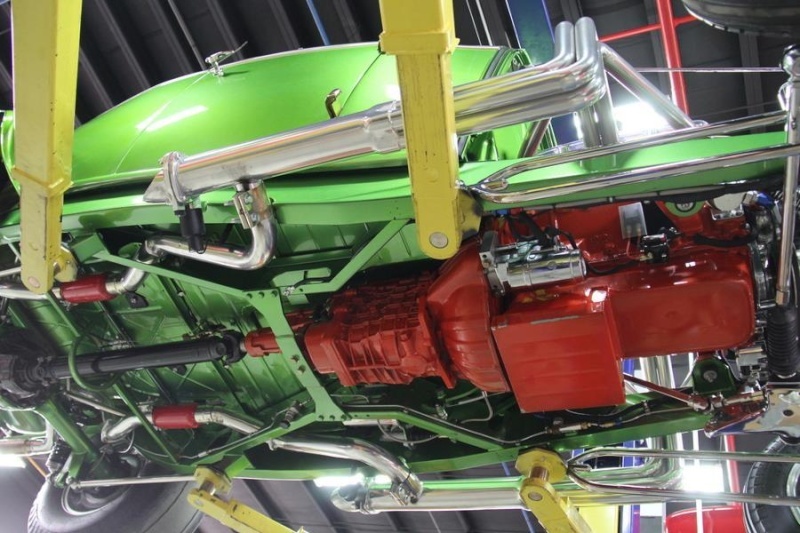 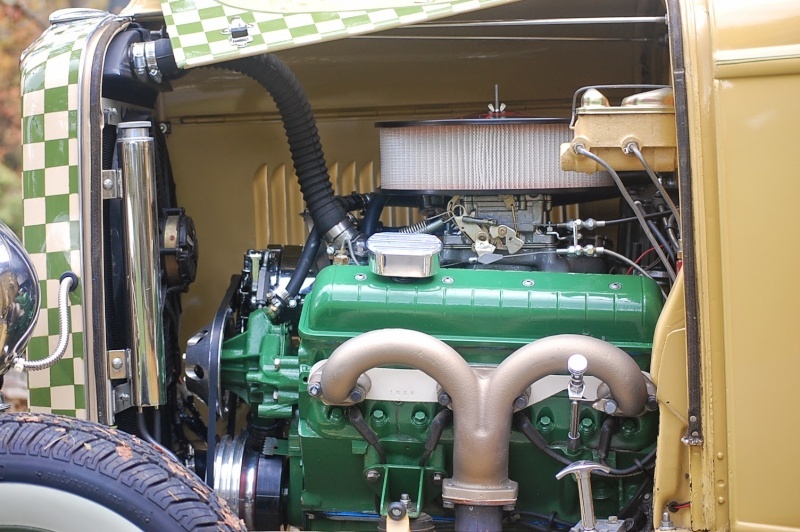 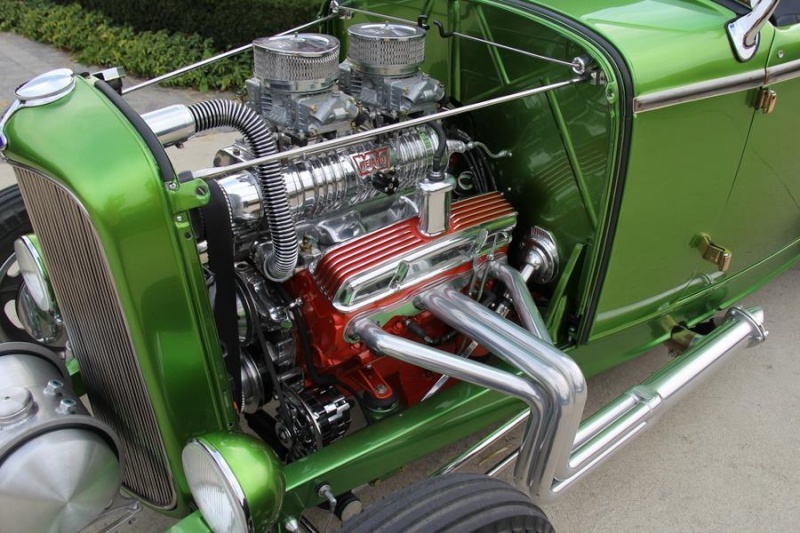 Chevy 383ci Stroker V8 Built by Keith Craft Racing Engines - 580 horsepower!